SWW Membership 2019 now live! 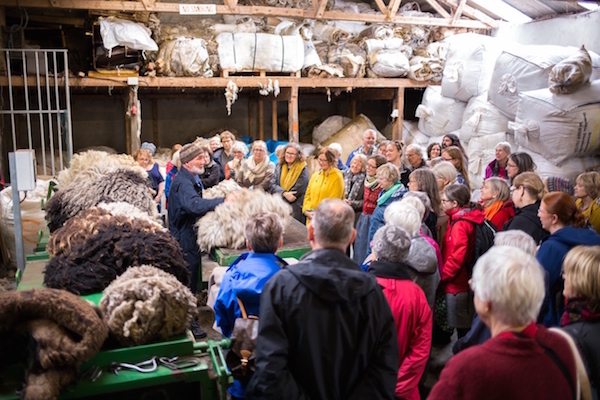 We are delighted to announce that membership for Shetland Wool Week 2019 is now live! Following on from last year’s success, we would like to continue to offer two types of membership, with the focus on benefits to you as well as helping to support the future of Shetland Wool Week. Peerie (little) soy wax candle which is made on the island of Unst, Shetland. Presented in a cute, reusable aluminium travel tin with lid, this 100g candle will burn for around 20 hours. The fresh and clean scent ‘Rocksalt and Driftwood’ has been created exclusively for Shetland Wool Week members. Shetland Wool Week members’ medium sized drawstring project bag featuring a design inspired by the Roadside Beanie. **Please note, all gift items will not be available until Shetland Wool Week starts on 28 September. There is the option to either collect them in person from The Shetland Wool Week Hub, or, if you are not attending the event, pay for post & package and your items will be shipped at the end of September. If your online order contains other SWW merchandise which requires shipping your entire order will not be processed until the Premium Membership gift items are available. Is this a rolling membership subscription? 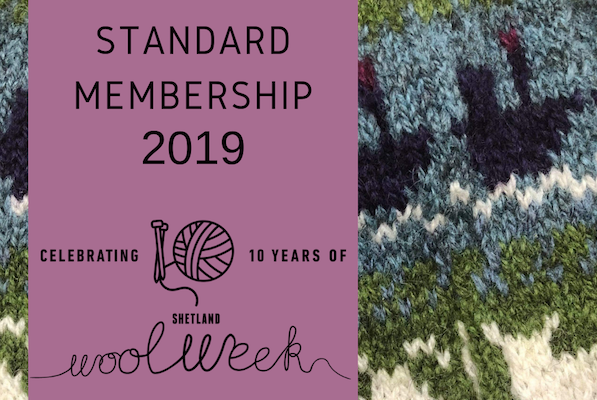 No, this is an annual membership, so if you were previously a Shetland Wool Week member, you will need to sign up again for 2019. Will there be SWW merchandise this year? Yes, we are planning a range of SWW merchandise, which will be available from the start of Shetland Wool Week. The items will be completely different from those offered as part of the SWW Premium Membership. Do I need to be a member of SWW to attend the festival? No, you do not need to be a member. Anyone can attend and buy tickets to Shetland Wool Week events. Tickets will go on sale to everyone at the same time regardless of whether you are a member or not. However, members will receive advance notice of the programme by email which will give them the opportunity to schedule which classes they would like to attend in advance. Tickets do tend to sell very quickly so it is definitely an advantage to prepare a wish-list of classes before the box office goes live. The Shetland Wool Week Box office will go live on Saturday 18 May in the morning. Further details will be released in April. When will the SWW Annual be launched? This will be published in time for Shetland Wool Week with pre-orders from early September. Please note it is not part of the SWW membership. We hope you enjoy the goodies and thank you for supporting Shetland Wool Week. Seasons of the Shetland Crofter Competition! Today Jamieson and Smith have launched their ‘Seasons of the Shetland Crofter Competition’. They are looking for photographs or stories that capture life as a crofter in Shetland. 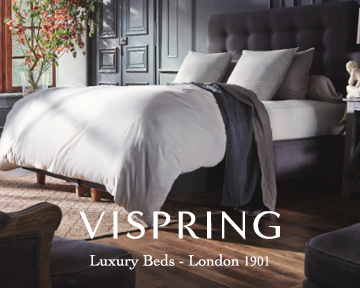 The top prize is a Vispring Shetland Wool bed and second prize is a two-night stay at Sumburgh Head Lighthouse, as well as a host of runner up prizes. 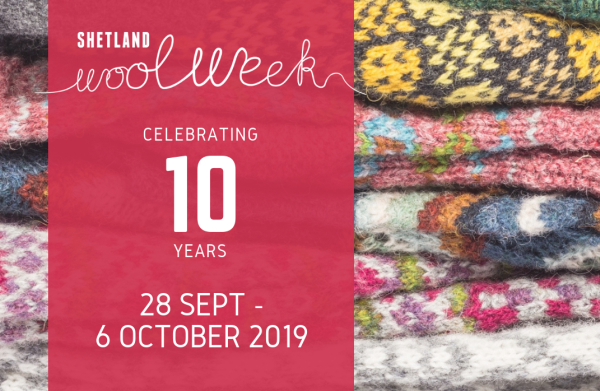 The winning entries will be published in a book which will be launched at this year’s Shetland Wool Week’s opening event on Sunday 29 September. The images can show crofting life in Shetland as it is today, or delve into your photo albums and see if there’s something there from your family history. Full details on how to enter the competition can be found on the J&S website. It’s literally days before Christmas and we’re getting in the festive spirit. Amid the flurry of school concerts, social events, last minute work deadlines and a few glasses of mulled wine along the way, we’re edging towards the holidays. We’ve been battling against Storm Deidre over the weekend, and the days in Shetland have been dark and short. Sometimes it’s hard to find the motivation to get going and the worry of a glitter topped Christmas seems unattainable. But we are not chasing perfection, and instead see this as a time to tie up loose ends, reassess and look forward to those moments connecting with friends and family. The great outdoors beckons, too, and while the wild winds can make getting outside a challenge, the weather also throws up magnificent seas and views that invigorate. 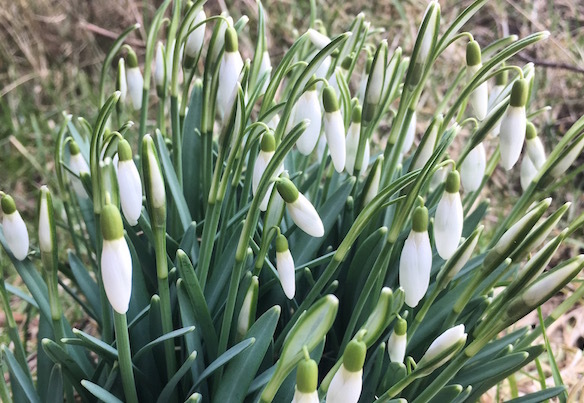 After a blustery walk there is always the added incentive to get back home, cosy up with woollen projects, and begin on plans for future ideas and trips. We are all for celebrating Christmas, fun, and laughter, but, like many, are choosing to reject the throwaway culture that often surrounds the season. We loved reading Hazel Tindall’s blog and her views on Christmas Jumper Day and fully support the alternative idea of a ‘favourite jumper’ that can be wornthroughout the year. A #lifetimegoal was achieved recently when Victoria managed to snap up one of Ella Gordon’s precious jumpers from her Vintage Collection. We’ve been eyeing it up for years and were drawn to the brilliant greens and tree of life pattern. 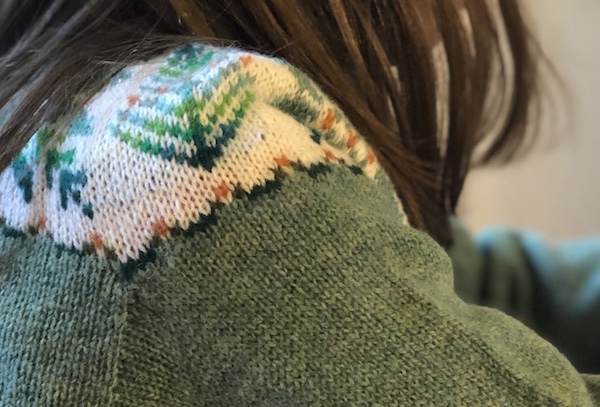 It’s a little small, so has been gifted to a young lover of Fair Isle, and has already been worn, admired and been a talking point in the classroom. Who needs sequins and a light up Rudolph nose after all? This has also been the season to celebrate the many talents of others living in Shetland. 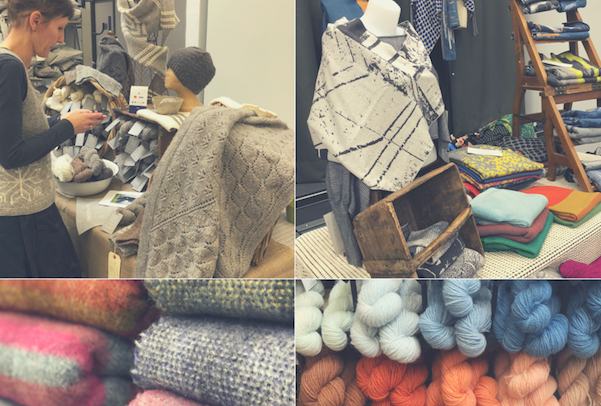 Back in November, straight after Shetland Wool Week, we enjoyed the Shetland Arts and Craft Fair.What an inspiring weekend admiring the work of talented makers, many of whom have other jobs, families and commitments that all have to be juggled. A visit to the newly opened V&A Dundee was also a highlight (and a great place to visit if you are heading for the ferry at Aberdeen). Set on the River Tay, the impressive architecture presents endless photographic opportunities. Inside it was wonderful to see Shetland’s contribution to the Scottish Design Relay as well as the display of Fair Isle patterned knitwear and a lace shawl in the Scottish Design exhibition, which features around 300 exhibits. Shetland Wool Week received some great coverage in the press this year too. The New York Times featured the isles and the festival on the front page of their Travel section. 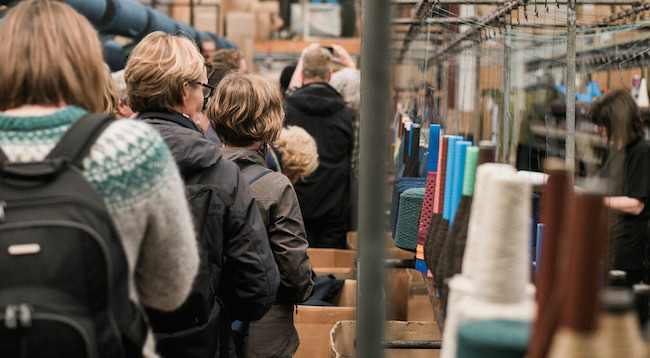 Juliet Bernard visited Shetland Wool Week and wrote about her experiences in The Knitter (Issue 132), saying “It is so hard to capture the whole experience in a few words, but the welcome we received from Shetlanders was so incredibly warm. They were more than happy to share their skills in an informal and generous way, which completely bowled me over. I learned so much, both in and outside of the workshops.” There is also a brilliant feature on Wilma, Terri Laura and Alyssa Malcolmson. 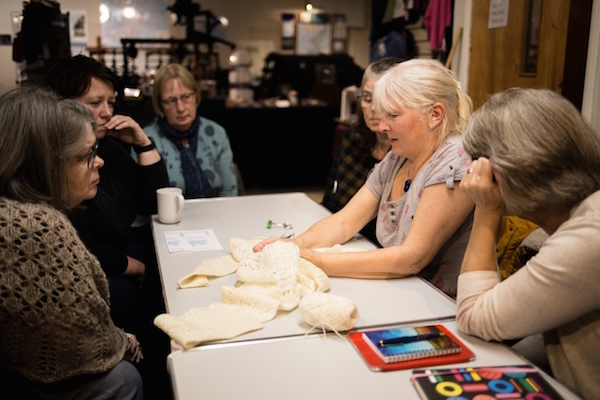 Fruity Knitting also joined us and over the past months have shared some fantastic podcastsbased on their time here, where they caught up with various tutors and personalities from Shetland’s textile and crofting community. There have been exciting developments at Shetland Museum as they have begun their Lace Assessment Project. The 400+ knitted lace objects are part of the Museum’s large Textile Collection, awarded the status of a collection of national significance in 2013. The project is being generously funded by Museums Galleries Scotland’s Recognition Fund. The two-year study will review, assess condition and design, and digitally photograph each piece in the collection, from simple scarves to a black cocktail dress. Designs of a unique character are being selected for charting and samples will be knitted,to be used as a handling collection for researchers. The individual motifs chosen for charting will be compiled in a publication at the end of the project. 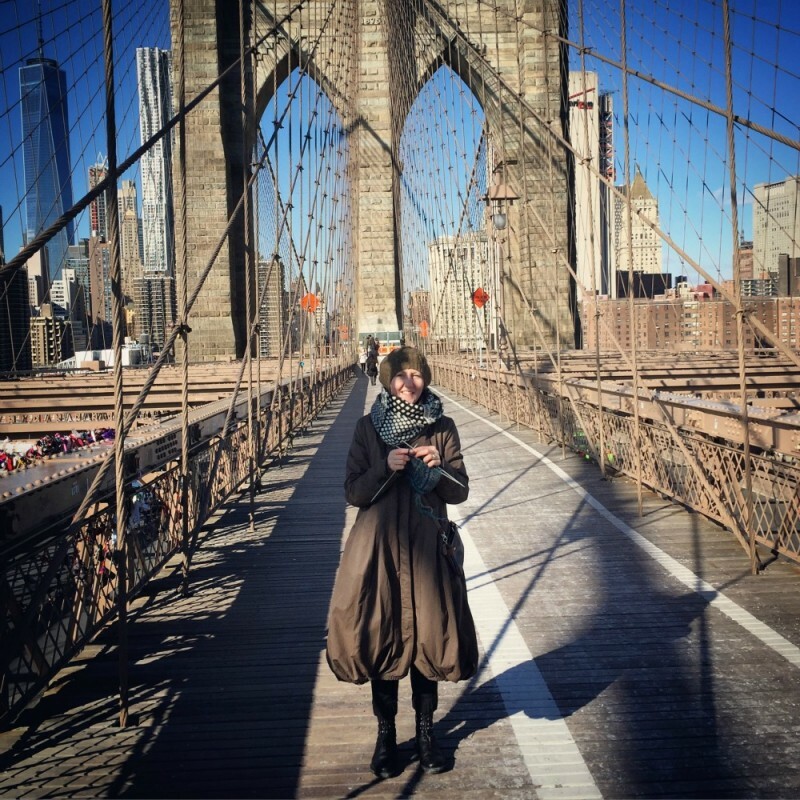 The Museum team will keep you abreast of progress, special discoveries, and stories about knitted lace on the project blog. It’s a fascinating project and we hope you’ll be keen to follow developments. The Lace Assessment Project developed as the obvious successor to in-depth research on the Shetland lace industry by Roslyn Chapman, School of Humanities, University of Glasgow, in partnership with Shetland Museum and Archives. Dr Chapman’s PhD thesis is now available online, check our Lace Project blog for further information and download link. This month we caught up with Shetland WoolWeek 2018 Patron, Elizabeth Johnston to find out more about her work. Born in Shetland to a Shetland family, she has always lived here and can’t imagine being anywhere else. Her mother’s family is from Cunningsburgh and her father’s from Sound, which is on the outskirts of Lerwick. She grew up in Lerwick butspent many weekends and holidays working with croft work at both Cunningsburghand Sound. She worked in finance, but knitting was always work as well. She hand knitted as a teenager, mostly Fair Isle yokes, and she later did machine knitting and finishing. Knitting was always a good second job. Now hand spinning ,hand knitting and natural dyeing, and teaching these skills as well as weaving is her main and only job. The answer to that question is – I have no idea. I have always knitted, and I think to begin with I just wanted to do what the adults were doing, and in the evenings that was knitting. As children we learned to knit garments. The first I knitted were children’s mittens, and whenI could knit them well enough, I sold them. Having earnings from knitting was an incentive to knit more. I saw spinning as a child and always wanted to try. When I did start spinning I was just hooked, it is very addictive. Dyeing was just an extension of that, and the colours from natural dyeing are so easy to work with. Weaving for me is on the warp-weighted loom, and that came from an interest in Shetland’s long and continuous textile history, with much of that being weaving on the old loom and with spindle spun yarns. Where and when do you usually spin/knit? All day, every day, anywhere, anytime…it is full time work for me. But maybe not on Sundays. A typical day for me starts with preparing fleece for spinning. What needs to be done will depend on whether I am starting to usea fleece or if I am part way through spinning a fleece. Fleece need to be skirted, graded, teased, then carded. After a couple of hours of fleece preparation I should be ready to spin for the rest of the day. I have to take a break through the day to check and answer emails and check social media, but otherwise I would spin through the afternoon. Knitting is more of an evening job, and the perfect knit would be a hap which I can knit easily whether a visitor stops by or I watch agood film on TV. Winter time is when I get most of my spinning done, so right now I am spinning to get stock levels up. It is, however, good for the soul as well as the body to have some knitting to do as well, for a bit of variety. And as we all know there has to be more than one knitting project on the needles. I have just finished an allover waistcoat, a commission in my handspun yarns. Then there is a shawl which I have been working on slowly for a few months, and writing the pattern as I knit. The pattern is copied from a shawl which was knitted about 70-80 years ago so the pattern will have a little story with it. I have a Fair Isle throw almost finished, a sample for one of the colourways of my Fitful Head cushion and throw pattern. And, as it is December, I am knitting a few slouchy toories for grandchildren for Christmas presents. I might write the pattern for those for next year. They are knitted in one colour but with a 2-coloured rib where you can play with colour. I am also working on an idea for a different style of shawl, which will perhaps have a jumper or waistcoat to match. If the design works I will write the pattern and perhaps have it ready for Edinburgh Yarn Festival in March. What has been your most challenging knitwear/spinning/dye/weave project to date? … that has to be my Lunklet Jacket! The first one was a very satisfying knit. The problems started after having it at EYF in 2016. I displayed it as a sample of my handspun lace yarns, where we were repeatedly asked for the pattern. My sisterwas with me on the stand and her response to being asked was– no, sorry, it is in her head, – and that was how it was knitted, straight out of my head. That is how we design and knit. So I changed that response to – no, but the pattern will be here next year. I did not think of the difficulties of writing the pattern as I had knitted it, as a complete garment with no seams, and writing for different sizes. Of course I did have a year to figure it out, but then I did not start working on it till January the next year. That meant that the pressure was on to complete it. It took time but I completed the task and the pattern has been very successful. Now that is a hard one. Mostly I am spinning,and spinning natural coloured Shetland fleece. When choosing fleece I am looking for soft fleece in a range of greys and browns. Often a fleece will just say I have to take it – it is just the look of the fleece. From those spun yarns I will choose some as base colours to over-dye with natural dyes to get a range of colours which will shade. Inspiration should be involved with choosing colours for Fair Isle and Lace garments, but it is really just those colours that are my inspiration, if I could call it that. I will see two colours that appeal to me, that look good together, and to that first two colours I will add more to give a ‘mood’ to a colour scheme. Very occasionally I will have something that does inspire a design, as with the Shoormal Neck Shawl pattern. In that it was a beautifully coloured high tide line on the beach, the line that we call -shoormal. I don’t think of neutrals. I would think naturals (which are all those greys and browns in our fleece) and colours. For me it has to be natural fleece colours – and blue – you almost can’t get a better colour than blue. In the past we did have a natural blue fleece, called ‘blaegit’, which translates to ‘blue’. What has being SWW Patron meant to you? It was a privilege to be asked to be Patron, and perhaps a bit daunting to be the face of Shetland Wool Week for a year. A photo of my hand spinning were on the front of the catalogue and there was a photo of me with a message inside as well.That and the hat pattern made me quite visible – something I don’t think I ever am (but apparently I am wrong!). I did enjoy talking to visitors during Wool Week and seeing all the hats that were knitted, seeing the different colours people had used, and quite a few in my handspun yarns. There are still hats being knitted with photos regularly coming up on social media. Oh, there are so many good Shetland words, it is such a descriptive dialect. If I stay with spinning then I could choose ‘hesp tree’ which is a niddy noddy, or ‘sweerie box’ a lazy kate, but my most favourite word would have to be ‘hentilagets’. As a child we were sent out to gather hentilagets. Some are now gathered by visitors to Shetland and there are always some Wool Weekers who come in to my classes with a pocket full of hentilagets to ask if they can use them. So what are hentilagets? ‘hent’ means to pick up or gather, and a ‘lag’ is a tuft of fleece. As Shetland sheep are a primitive breed they shed naturally and many will therefore loose some tufts of fleece before they are sheared which we can then pick up– those are ‘hentilagets’. That has to bethe sea, it is a constant, it is always there and almost always in sight. It is the sea combined with the landscape, the green fields and the rocky heather hills, the skerries, voes and geos, which make the magic in the atmosphere we see in the changing weathers. An extra bonus is to watch baby ducks feeding with their mother in the ebb stones on the beach, or watch a seal chase a small fish in the shallows of a sandy beach, and all from your bedroom window. And on a final note, we were inspired by the responses to #Wovember in November, a collective appreciation of wool, celebrating its unique qualities in stories and pictures. It was touching to read various posts on instagram and hear just how passionate people are about wooland what it means to them on a personal level. What particularly resonated were the comments that said that wool signifies so much more to them than its physical form, and how it brings joy, comfort and calm. Some talked of how wool means connections to people through shared experiences, and is a way to show love and care. To others, wool brought hope and possibility. In our minds, pretty much the perfect Christmas message. We’re really on the countdown now … literally days from launching the ninth Shetland Wool Week! We can’t wait to welcome you all to Shetland from places near and far. 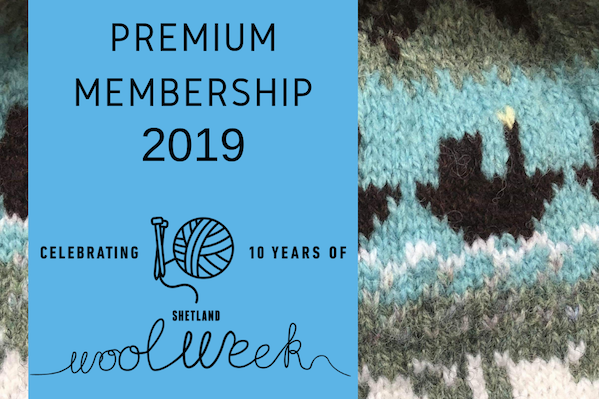 Annual Shetland Wool Week 2018 membership is now live! This year we are introducing a few changes to our membership with the focus on benefits to you, as well as supporting the future of Shetland Wool Week. Shetland Wool Week depends on its many supporters in everything it does. Your generosity is important to us and provides us with the life blood to continue delivering a varied and inspiring event, as well as helping to preserve Shetland’s textile heritage and its rural farming community for future generations to enjoy. We’re now in the final week before Christmas and, as always, it’s hectic with too many things to fit in – last minute work commitments, last minute shopping, pressures to get the house organized and the fridge well-stocked. Island life also throws into the mix the extra worry factor of bad weather and whether transport connections will run smoothly, or the supermarket and parcel deliveries will make it in time. It is a crazy time of year, but there is no hiding from the fact that we love it! We enjoy the traditions, the food, the glitter and sparkle – and the chance to be ‘off’ and spend time doing all the things we love most, whether that’s cosying up by the fire, knitting, visiting friends and family, or making the most of the wonderful Shetland scenery. We caught up with some of our Shetland Wool Week tutors to find out what the festive period means for them. We can’t believe it’s a month since Shetland Wool Week 2017 ended. What an amazing, inspiring, creative and wonderful nine days it was! We’re still buzzing. Having had a break to recover from the adrenalin surge it’s lovely to be able to look back at the photographs, swap stories, read your social media feeds and all your comments. As always, we are staggered by how far people will travel for SWW, and this year was no exception. 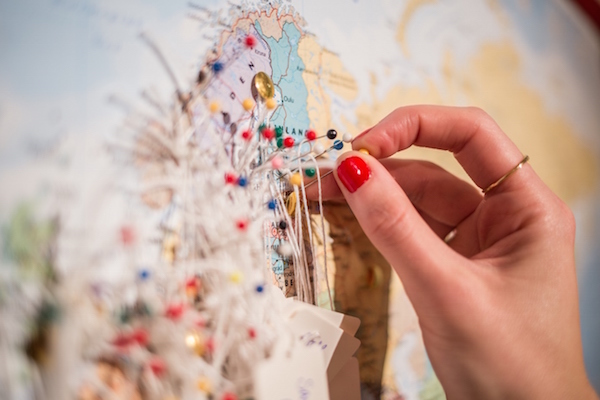 The visitors’ map, where everyone is invited to pin where they travelled from was a great indicator, with marks on Australia, Canada, the East and West coasts of USA, Scandinavia, Europe, Israel and the UK. At last, the wait is over and the SWW Annual Vol III (2017) is now available to pre-order. This year it’s bigger than ever with 12 exclusive patterns and six essays. As ever the photography is stunning and much of it was taken at Shetland’s historic south end of Commercial Street in Lerwick. We’re thrilled with how it has turned out and are in awe of the talents of all the contributors. Thanks also to Alex Mazurov for his incredible photography and Ruth Brownlee for the loan of her amazing SeaWinds house. Summer in Shetland always means the fabulous agricultural shows. These offer so much to the community and visitors – and are also an opportunity to showcase livestock, knitwear, baking, horticulture, arts and crafts, stalls, kittens, ducks, dyed yellow sheep: you name it, it’s likely to be there! Hazel Tindall visited all the big shows: in Voes, Cunningsburgh and Walls. Here are some of her highlights. 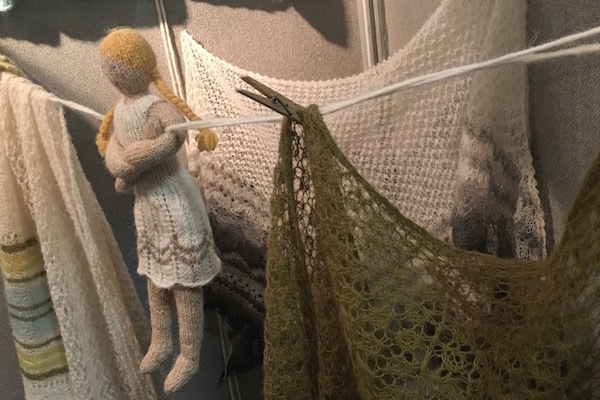 Shetland Museum’s Textile Curator Carol Christiansen tells us about knitting in the north of Sweden and the work of accomplished visiting SWW tutor Karin Kahnlund. Last Saturday the Shetland Guild of Spinners, Weavers, Dyers and Knitters gathered at the Shetland Textile Museum for their monthly meeting. We were treated to an interesting talk by Brita Hövenmark, STM’s custodian, about knitting in the north of Sweden, including tvåändsstickning, or two-end knitting (sometimes called twined knitting). Brita knows a lot about the knitting traditions from her homeland and is herself an accomplished designer and knitter of this technique. She showed us gloves and mittens she had made, the fabric dense and warm. We have exciting news! Shetland Wool Week dates for 2018 have been announced! Due to the recent support and sponsorship from Loganair and our key longstanding sponsors, including Jamiesons of Shetland and J&S, SWW will definitely be going ahead next year. The dates are 22 – 30 September. Shetland Amenity Trust is delighted to announce that Loganair, one of the Scottish regional airlines that service Shetland, has agreed to support Shetland Wool Week from 2018, securing the future of a hugely successful festival which is crucial to the Shetland economy. As many of you will know from first-hand experience, we were overwhelmed by the response to ticket sales back in May. There are still some tickets available, but we have also teamed up with our fabulous tutors to put on a few more! Classes will go on sale on Wednesday 12 July at 1400 BST on the Little Box Office/Shetland Wool Week. We are delighted to announce that a second trip to Fair Isle during SWW has been organised! Rather than selling the tickets via the Box Office we will allocate them on a ‘lottery’ basis (* see details below). The trip will take place on Friday 29 September and six lucky people will have the chance to take in Fair Isle’s history and culture. 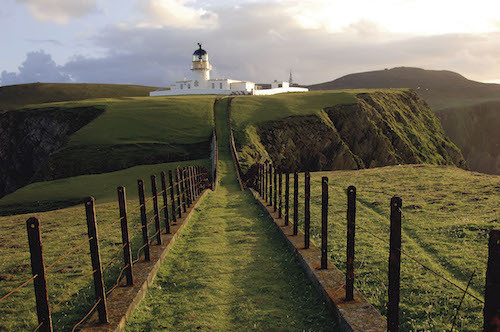 Admire the views from the lighthouse, enjoy lunch and afternoon tea, and soak up the experts’ knowledge on Fair Isle’s knitting patterns and colours first hand. All transport included in the price. In the email subject heading put: ‘Fair Isle Experience Draw’. We will select six names at random and contact you separately to organise payment. Note: Please note that due to Fair Isle’s unique geographical location this event can be cancelled at short notice in the case of adverse weather. This trip ends an hour earlier than the Monday tour due to changes in the flight timetable. However, the itinerary remains the same. Two more tours to Ronnie and Sue Eunson’s organic sheep farm have been added to the programme. Look through fleeces in a wide range of natural colours, and chat about what farming/crofting in Shetland is really like. In this class you will knit a lace sampler. You’ll have a chance to try various Shetland lace patterns, such as old shell, new shell, cockle shell, horseshoe, ring, fir cone, leaf, bead etc as well as garter stitch, stocking stitch and moss stitch. Broaden your knowledge of the Shetland knitting dialect too as Nan will be referring to many Shetland ‘makkin’ words throughout. This class is aimed at all skill levels. Join Jeannie and Janette Budge and make your own Fair Isle-style pouch bag. 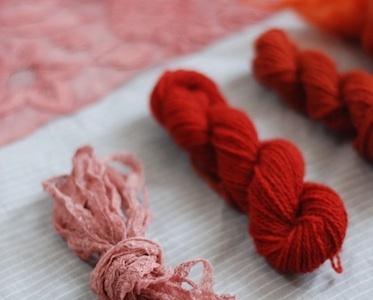 An opportunity to practise blending colours, try a knitting belt and knit with two colours. This class is aimed at the intermediate level knitter. In this class you will knit in the round a small piece of work in two colours – part pattern and part steek. Appropriate for all levels. This class will introduce you to the Cockleshell lace pattern – a well-known and very recognizable pattern in the Shetland lace tradition. It is appropriate for all skill levels. This introductory class with Sheila Fowlie will show you how easy it is to knit lace, and how traditional Shetland lace patterns can be used with different weight wools. This is aimed at the intermediate level knitter. 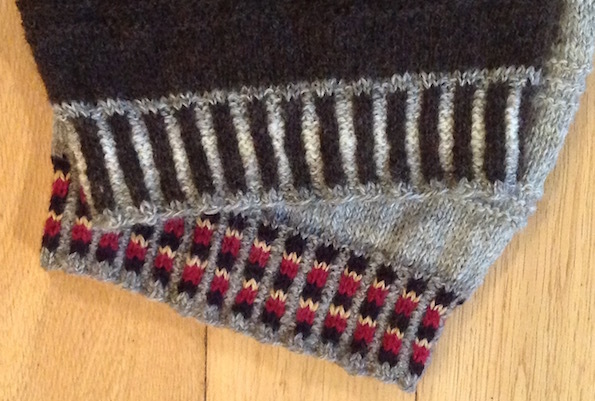 Launch into two-colour knitting (Fair Isle, Norwegian, and Armenian) with an arsenal of tips for two colours (traditionally one in each hand). Join Shetland Museum & Archives Visitor Services Assistants for a tour of the Textile displays. The Textile Collection is Recognised as a collection of national significance. 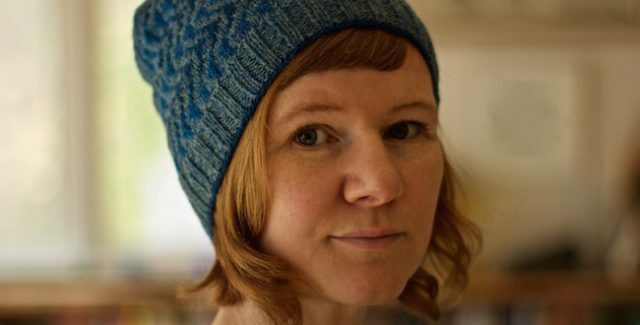 Join Ingibjorg Sveinsdottir and Maja Siska in this class where you will learn about how to crochet a ‘knitted’ button band. It looks like it is knitted horizontally and it is a beautiful finish to any Fair Isle or Icelandic cardigan. This class is aimed at the intermediate level knitter. We’re delighted to be able to offer a few more spaces to Hazel’s popular Fair Isle yokes class. You’ll learn how to knit a section of yoke to understand the shaping, follow a chart and use colours. This is an intermediate level class. Remember, there are still spaces available on classes listed in the programme, so please take another look and book your spot. The Shetland Wool Week 2017 programme was launched yesterday and we had a record number of sales. Despite the initial technical glitch to the booking system, many people were able to book a range of events. We are working with tutors to see if we can put on additional classes during Wool Week. We will confirm this in the next few weeks once we have allocated venues. In the meantime, as of Wed 17 March, there are still over 1,000 bookable tickets left, including the following. If you go to the search box at the top of the page with the name of your preferred class and choose ‘Book Tickets’ it will take you straight to the Little Box Office website. Just a reminder to all those planning to join us at this year’s Shetland Wool Week that tickets will go on sale tomorrow, Tuesday 16 May at 1.00pm BST. You do not have to be a SWW member in order to buy tickets, although those of you who paid for membership, will have had a preview of the programme for the past week. The Little Box Office does not accept PayPal. In order to book tickets you will need to pay by credit or debit card (Visa, MasterCard or American Express). You will be able to book 2 tickets at a time for smaller events, and for larger ones, such as talks and tours, 4 at a time. Once a ticket is selected and added to the basket, it is unavailable for any other customer to select for 60 minutes, to allow you to add other items and check-out without rushing. There is absolutely no requirement to set up an account at The Little Box Office, and you will be able to purchase event tickets without doing so. However, if you do decide to set up an account, your contact details will be saved and you will be able to view your past orders. Tickets are non-refundable (unless a class is cancelled). The quickest way for you to book tickets is directly online. We must stress though that as we are a small team, your call will be placed in a queue. If you would like to order a printed copy of the programme you’ll be able to do this from Tuesday through the SWW website. No rush here as there will be plenty of copies available. Copies are free, although there will be a charge for postage and package. And finally, please don’t be disappointed tomorrow if you’re unable to get hold of your first choice of tickets. There is plenty going on throughout Shetland Wool Week, so there really should be something for everybody. Happy planning and booking and as always, thank you for your support. With the success of the book ‘A Legacy of Shetland Lace’ produced by the Shetland Guild of Spinners, Knitters, Weavers and Dyers in 2012, we decided to start work on another book – this time Fair Isle patterns using members’ own designs. 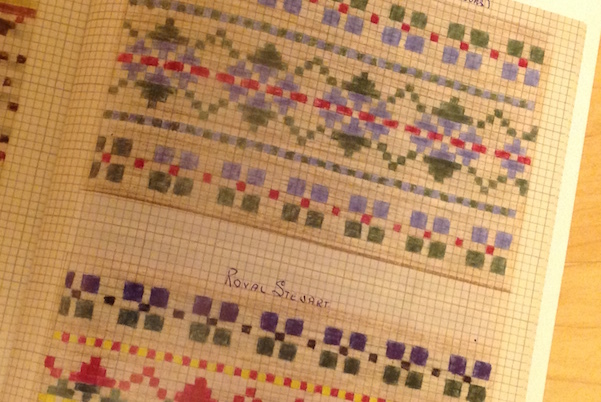 This prompted one of our members, Kathleen Anderson, to look out old graph books which had been given to her quite a few years ago by the son of the knitwear manager for Anderson & Co. where she previously worked. Kathleen took the books along to a Guild meeting where most of us thought the books should be produced just as they were. The Shetland Times published the books, into one volume, split into two parts. After the Guild had the book published, I decided I would like to try knitting one of the coloured patterns from it. I chose the two patterns, ‘Hunting McIntyre’ and ‘Royal Stewart’, thinking it would be fun to knit them both in a scarf. I tried to choose colours as near to the graphed picture as possible. The scarf is modelled by Linda’s daughter, Emily. We are still in the process of producing our own book of members Fair Isle knitting patterns, and hope to have it completed in the next few months. *Membership Update* Please note that due to high demand, the Full Membership option which includes a ticket to the Opening Ceremony is now sold out. You can still purchase standard membership which includes the official Shetland Wool Week bag and membership pack as well as early access to the programme a whole week before tickets go on sale. A small number of additional Opening Ceremony tickets will be available when event tickets go on general sale on 16th May. The real advantage of being a member is that you get a chance to have a good look through the programme in advance, which will be sent to you as a PDF by email on Monday 8 May. Bookings will go live on Tuesday 16 May at 1300 BST and this is when you can order tickets to all SWW events. Shetland Wool Week is a nine-day festival, and this year there are over 300 events from which to choose. Once tickets are announced many events sell out very quickly, so if there are specific classes, talks or tours that you want to sign up for, it is advisable to try and order them as soon as the Little Box Office goes live. The Opening Ceremony will take place on Sunday 24th September from 1900 – 2100 at the Clickimin Leisure Complex, Lerwick. It’s a fun evening with talks, Shetland entertainment and refreshments. 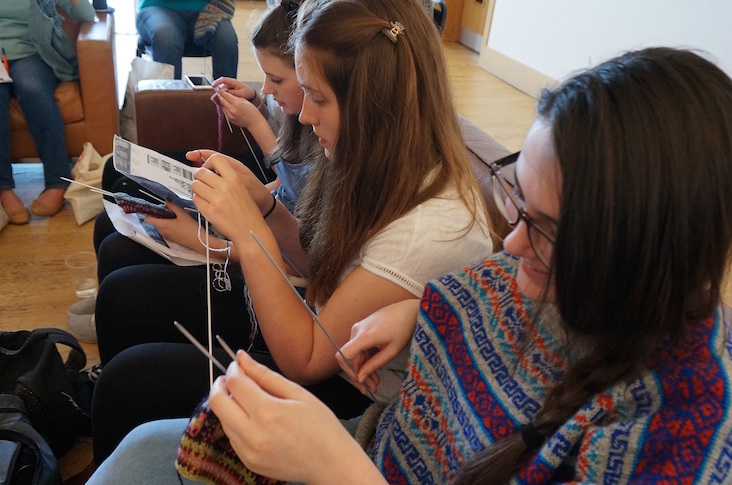 It’s also a great way to meet up with your fellow knitters and tutors for the week. We’re really looking forward to sharing the programme with you in the coming weeks. We’ve got some fantastic events lined up, and, as ever, an array of talented and inspiring tutors. Watch this space for updates! Here’s our woolly round up of Edinburgh Yarn Festival. 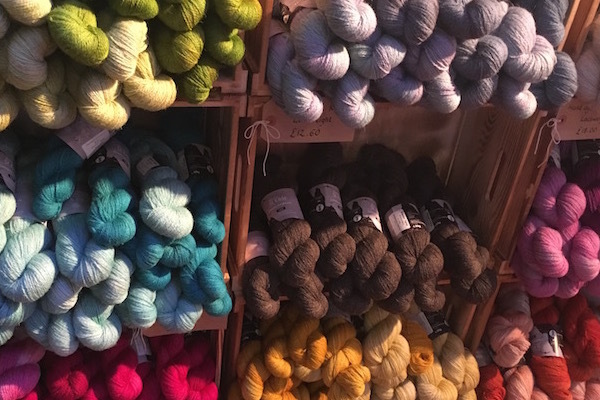 Anyone who has a love of yarn and textiles probably has a big red circle marked in their diary around the beginning of March – to highlight Edinburgh Yarn Festival – one of the biggest urban knitting festivals in the UK. It’s a big deal, attracting some 5000 visitors to the two-day market place, which is packed with vendors and knitwear designers from all over the world. It’s also a key event for the Shetland Wool Week committee, as this is where we promote our own event and announce the new guest patron for the year together with the launch of the official hat. 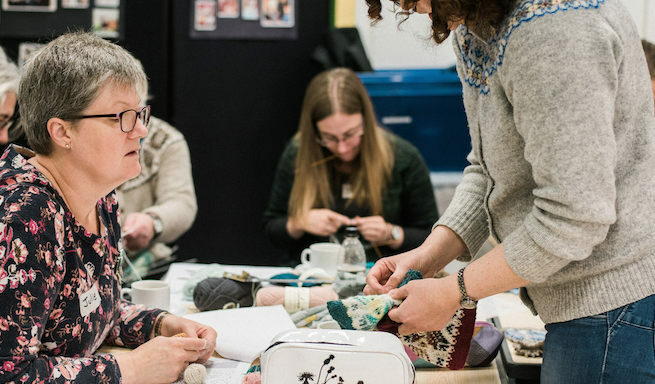 EYF is a brilliant place to meet like-minded, yarn and knitting obsessed people from all over the world. 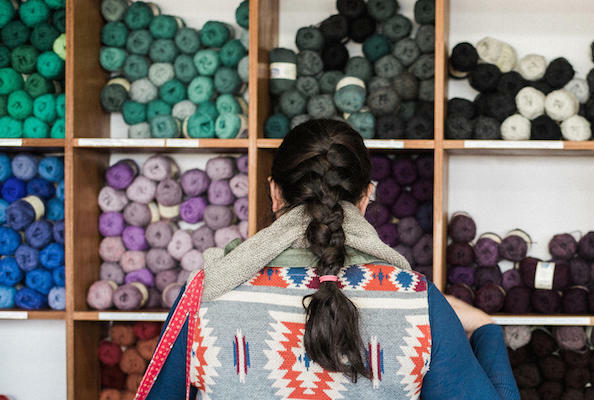 It’s impossible to leave without buying (another) stash of wool, a handful of buttons, a pattern or two.. and be inspired by the conversation and endless garments that vendors and visitors are wearing. Before the event had even kicked off at Edinburgh’s Corn Exchange there was already quite a buzz, with people wondering who would be stepping into Ella Gordon’s shoes. 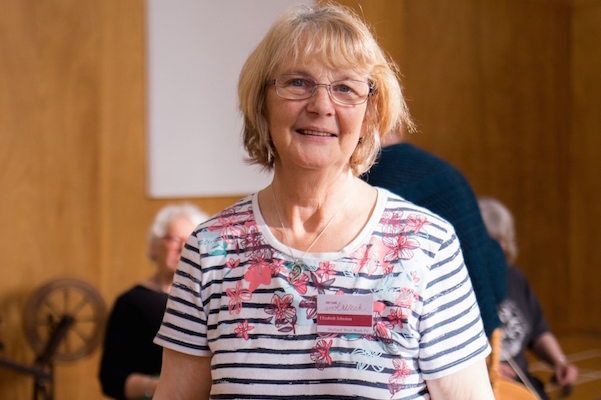 All was eventually revealed via SWW’s popular social media streams where we were delighted to announce Shetland-born knitwear designer, Gudrun Johnston, as this year’s patron. 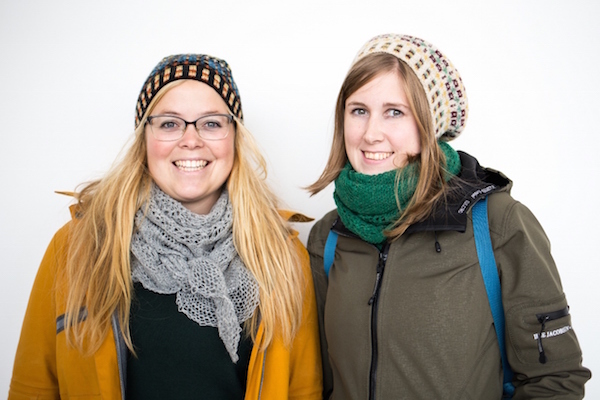 The official hat, the slouchy-style ‘Bousta Beanie’, designed by Gudrun, was also launched. Within minutes of the doors opening we had a steady stream of people wanting to meet with Gudrun, ask questions and take a copy of the free knitting pattern. The hat uses a variety of stunning colourways in Shetland yarns by Jamieson & Smith, Jamieson’s of Shetland and Uradale Yarns. It was also clear from people’s comments that enthusiasm and interest for SWW continues to grow, with many people prepared to travel long distances to visit the islands. For some, it is very much on the ‘bucket list’. We loved meeting you all and answering your questions. It was also great to see SWW patrons past and present at the stand (Gudrun Johnston, Donna Smith and Ella Gordon). This year there was a strong Shetland contingent with impressive stands from Jamieson’s of Sandness, Uradale Farm, and Shetland Handspun. The patron is an integral part of Wool Week and generates a lot of international interest. Gudrun Johnston is an enthusiastic ambassador for Shetland’s textile industry, so she was a natural choice for the SWW committee. Gudrun was in high demand throughout the event and did a live podcast with Blacker Yarns. A frequent visitor to Shetland, she has attended every Wool Week since it started in 2010. 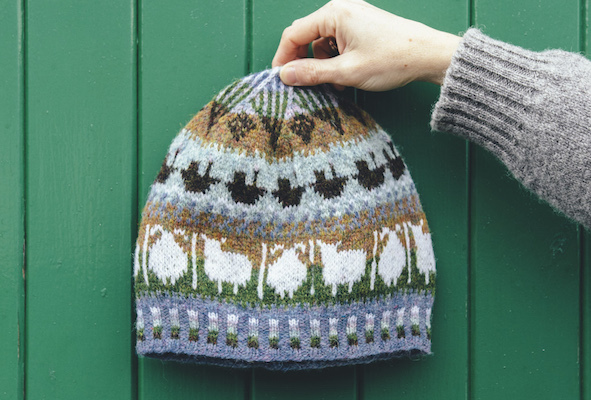 Many of her designs feature Shetland patterns and yarns, and her Wool Week, Bousta Beanie hat design was inspired by the ever-changing shades of the Shetland landscape. She wanted to reflect this in a simple Fair Isle pattern that floats between one background colour and two contrasting colours. The beauty of this approach is that it creates endless possibilities for colour combinations. In fact, Gudrun surprised us on the day by arriving with a fourth suggested colourway, which uses softer shades of blue. Her gorgeous combination uses J&S 2-ply jumper weight, Shade 2; FC 39MIX; FC34MIX. It was heartening to see such interest for SWW and the hat pattern at Edinburgh – we’ve been following everyone’s progress on social media. We look forward to seeing more of your work– please do share pictures with us by hash tagging #boustabeanie or #shetlandwoolweek2017 ! 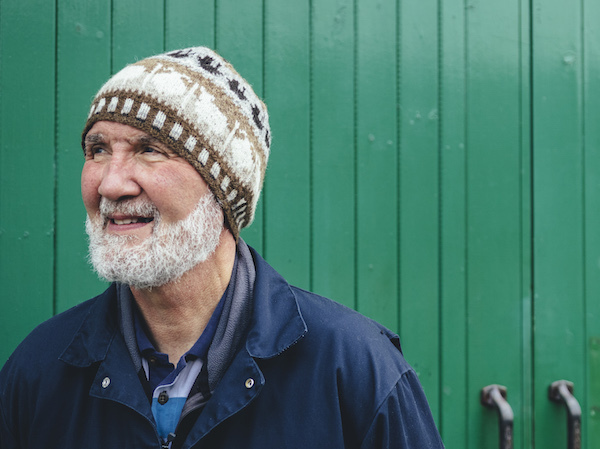 We have some very exciting news – the official Shetland Wool Week 2017 hat pattern is being launched today at Edinburgh Yarn Festival. We’re also thrilled to announce that the SWW 2017 patron is one of our favourite knitwear designers, Gudrun Johnston – and she has designed this year’s official hat pattern. Inspired by the myriad shades of Shetland’s landscape, Gudrun has named her wonderful slouchy style hat the Bousta Beanie. The pattern is available to download now and printed copies are available for those who are attending the festival. We’ll be at stand M8 together with Gudrun, so we look forward to seeing you there! Knit the hat in any of the suggested colours or choose your own variations and wear it to Shetland Wool Week 2017. Remember to share your pictures with us using #boustabeanie or #shetlandwoolweek2017, we can’t wait to see your creations. Knitwear designer Gudrun Johnston will be the guest patron for this year’s eighth Shetland Wool Week. She was a popular choice for the festival’s committee and we’re delighted to have her on board. Gudrun’s Shetland lineage runs deep. She was born in Levenwick, Shetland in the 1970s and her grandparents were from Skerries and the Ness. Now based in America, Gudrun has successfully relaunched the Shetland Trader, a design company, first began by her mother, Patricia Johnston. A regular visitor to Shetland, Gudrun has attended every Wool Week since it started. Many of her designs feature Shetland patterns and yarns, and she is inspired by the myriad shades of colour that can be seen throughout the islands’ landscape. 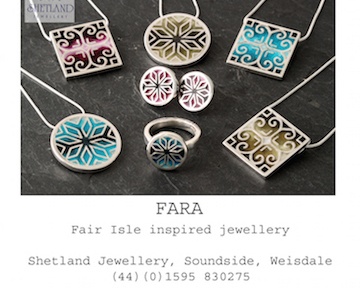 Through her designs, publications and teaching she has been able to share Shetland’s rich heritage with a broad international audience. To find out more about Gudrun visit her website. ‘Taak dy sock’ was an expression Donna Smith was familiar with whilst growing up. Here she discusses the origins of some ‘knitting’ words in the Shetland dialect and how they are still very much in use today. 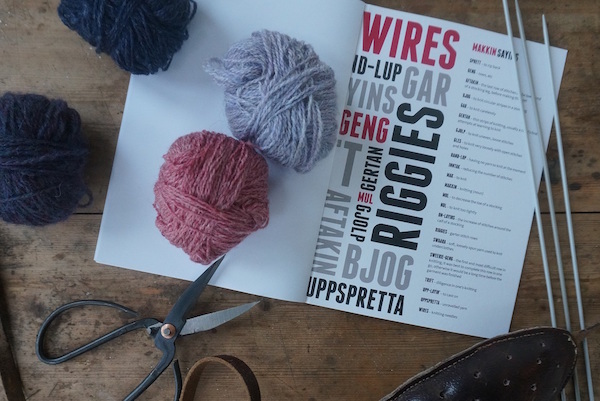 Those of you who have attended classes or events at Shetland Wool Week and are not familiar with the Shetland dialect might notice that there are many different words we use in Shetland and interestingly many of them involve knitting. Often for a local teacher, it can be tricky to try to ‘translate’ the words or words to be used, particularly when nervous (I am speaking from experience here!). Many of the words and terminology used to generally speak about knitting are dialect words, for example, we speak about laying up loops (casting on stitches), wires (needles), wirsit (wool yarn), dressing (blocking), we call our knitting “makkin” and the the verb “knit” is “mak”. The origin of the Shetland dialect, as any language is, is complicated and defined by the history of the place, its ownership, and the people living in and visiting the islands, amongst other things. The Shetland dialect is largely a mixture of English, Lowland Scots and Norn, which is a variation of Scandinavian languages. Norn is now extinct but used to be spoken in Shetland from around the 9th century until it eventually was largely superseded by the Scots language in the 18th century and became no longer a distinct language. A large number of distinct words are still found within the Shetland dialect today, many of the words are used to describe things that were a large part of day-to-day life such as the weather, crofting, fishing and knitting. For example according to Jakob Jakobsen, who extensively studied the Norn language and in turn compiled the Etymological Dictionary of the Norn Language in Shetland in the 19th Century, the word “makkin”, the Shetland dialect word for knitting, comes from the Norn verb “makk” a which is defined by Jakobsen as “to knit woollen yarn”. Sweerie geng = the first row in knitting. This is often thought to be the most difficult one and so it is best to complete it in one go, otherwise it would be a long time before the garment is finished. Interestingly, many dialect words are only used in certain places within Shetland, and I still often hear words I have never come across, many by the older generation. I love finding new words but I often have trouble remembering them; I must learn to write them down! A collection of words were made before Shetland Wool Week last year and printed inside the notebooks that were for sale. I hadn’t actually come across many of those words so it’s really important to compile them and write them down while we can. Like the knitting heritage, the dialect is something we need to make sure we preserve. A phrase I used to hear my Granny say to us was “Taak dy sock and hadd dee oot a lenger” which was an invitation to come along with your knitting, basically it means take your knitting to prevent boredom. So, if you have your knitting you won’t get bored – sounds right to me! 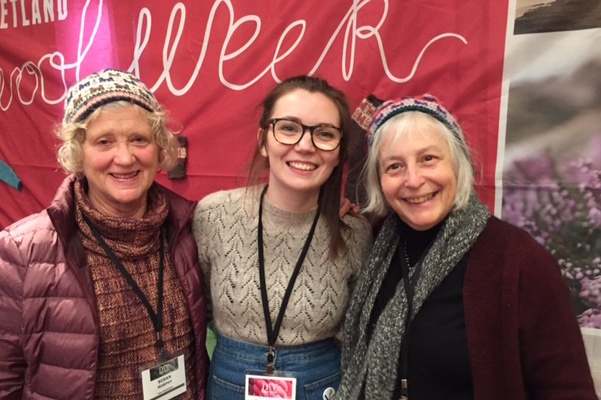 Shetland Wool Week and its patron Ella Gordon have just returned from a packed few days in New York where they and Ella’s ‘Crofthoose hat’ hit the North American market at the popular Vogue Knitting Live show. We escaped the storms in Shetland and arrived in NYC, home to 8.5 million people, where we were met by a world of contrasts, noise and colour. 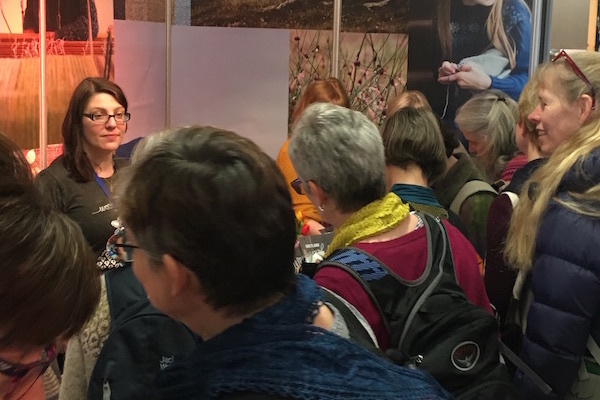 This is the second year we have attended the event – which is one of the biggest dates in the knitting and yarn calendar on the East Coast, attracting around 8,000 visitors. 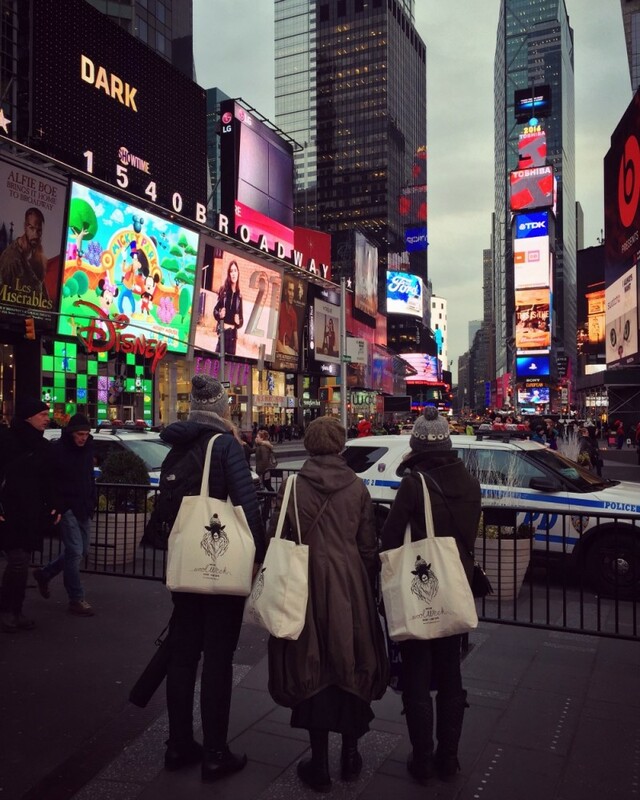 It took place in Times Square, a somewhat incongruous setting, and, over three days, knitting aficionados indulged their passion for yarn with thousands of like-minded people, bought endless quantities of wool from stall holders, attended classes, listened to talks and watched fashion shows. It was also a wonderful opportunity for visitors to wear their beautiful hand-knitted creations and there were many moments spent admiring and sharing compliments. 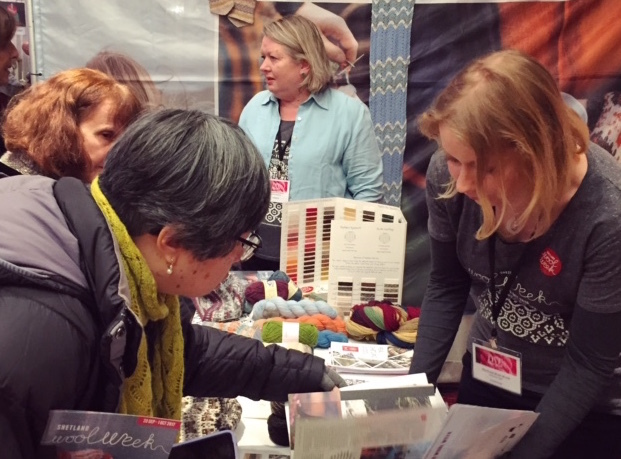 Our Shetland Wool Week stand attracted a lot of attention and it was so encouraging to be met with such enthusiasm. People seemed genuinely delighted that we had made a return visit and it was a wonderful chance for us to talk about our favourite things: Shetland’s textile industry and heritage, the yarn, the islands, as well as answer any technical questions. We also loved meeting old friends and making new ones too. 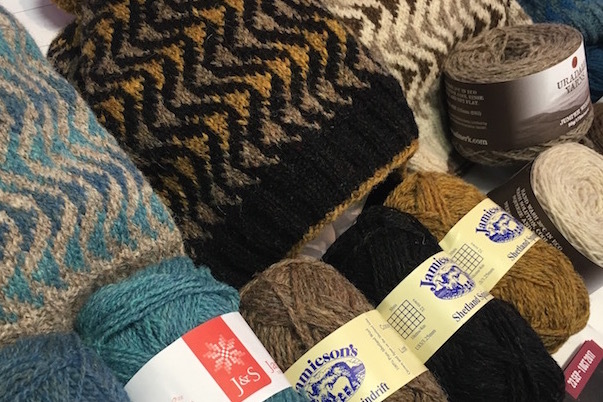 We had taken samples of the different crofthoose colour ways – from Shetland Organics, Jamieson’s, J&S, and Spindrift Crafts – among other Shetland samples. People appreciated the chance to be able to touch and feel the yarn and admired the different colours, especially the natural dyes from Spindrift. Yarn art is a key component of the event and there were some fantastic pieces on display, but the highlight surely had to be the magnificent depiction of Claude Monet’s iconic ‘Woman with a Parasol’. Produced in Europe by Citémôme it is the result of 100,000 knitted squares. It really was a masterpiece and made a dramatic backdrop to the non-stop fashion shows which took place. Outside of the event, we gradually started getting the hang of Manhattan’s grid plan. Seeing iconic buildings such as the wonderful 22 storey, triangular Flatiron which was built in 1902 was one to tick off the bucket list. Walking the High Line, a converted train track, and now an urban walkway with incredible views and public art was another highlight. We loved soaking up the culture and found the architecture, food, textures and colours an endless source of inspiration. Thank you for having us NYC. We hope to be back and also see many of you at Shetland Wool Week soon. Shetland Museum curator, Carol Christiansen, tells us about about a recent donation to the museum which hails back to the oil boom days of the 1970s. Parcels of knitting sometimes arrive at my desk from people who wish to see it returned to Shetland. A small pair of mittens, in very Christmassy colours, appeared a few weeks ago from Hampshire. They were donated by Brenda Dawtry, in memory of her late husband Neil, who passed away earlier in the year. Their story is set in a time of great change for Shetland. In the 1970s a huge terminal for North Sea oil extraction was built at Sullom Voe, in the north part of the main island. Oil and gas development has transformed the islands, greatly increasing the standard of living and attracting workers from around the world, including Neil Dawtry, who worked as an electrical engineer. On his days off he explored the islands and during one of his excursions he met the Nicolsons of Brunga House, Northmavine parish. They were an elderly couple who had raised a family of four on a small croft. 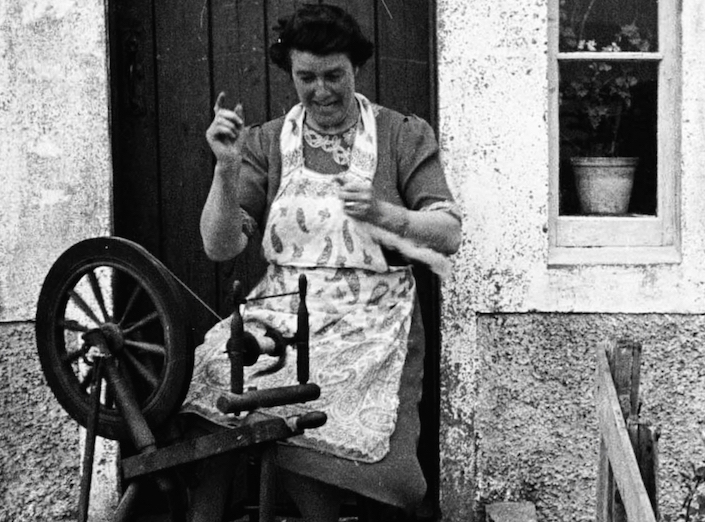 As a crofting wife, Kirsty Nicolson (1898-1985) knit her whole life, and sometimes demonstrated spinning to tourists at the St. Magnus Hotel in Hillswick. On the back of Mrs Nicolson’s calling card Neil wrote ‘Mr and Mrs Nicolson bred their own sheep, sheared them, spun and dyed the wool, knitted it up. I bought her last pair of mittens. Mrs Nicolson’s sight failed. 1979’. 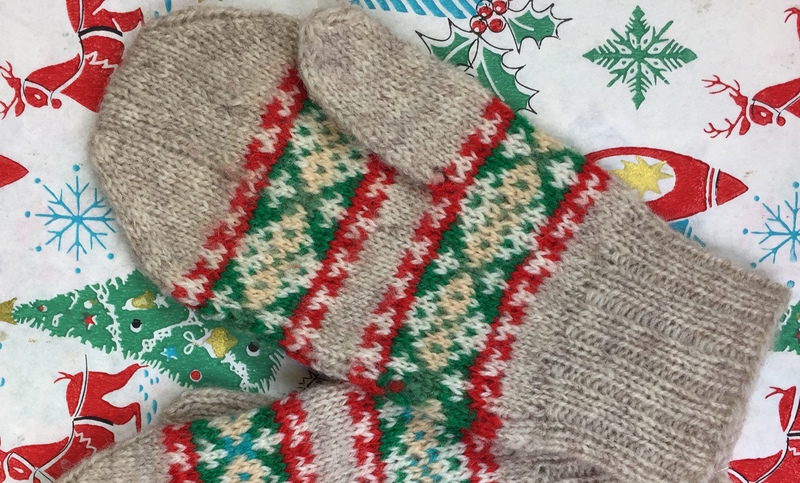 The mittens are in fawn wool with green, white and yellow diamond fair isle pattern stripes, bordered by a red and white small pattern. The left mitten has a central band of turquoise in the fair isle diamond motif, whereas the right mitten has a slightly lighter green colour. Perhaps this colour difference was due to Mrs Nicolson’s failing eyesight at age 81. She told Neil that she had spun, dyed and knit the mittens from her own wool, and had completed them in one day! However, the mittens are not made from hand-spun, hand-dyed wool, but rather typical Shetland jumper weight machine-made yarns. No doubt there was some embellishment about the making of the mittens in hopes he would buy them, which he duly did for his then future wife, Brenda. We are grateful to Brenda for her kind donation. Donna Smith meets regularly with a group of young knitters from the Anderson High School. Here she explains how the group came about and what they’ve been up to. Every Thursday at lunchtime during school term, a group of youngsters meet in one of the biology classrooms at the Anderson High School in Lerwick to knit. The group consists of pupils, ranging from 12 to 18 years old, and school staff, and attracts a range of individuals from those who have never knitted before to those who have been knitting for several years and are expertly designing and knitting their own Fair isle garments. This group is known as the Anderson High School Maakin and Yakkin (knitting and talking) group. Over the past few weeks the group have been busy knitting garter stitch triangles (this has helped them practise casting on and decreasing) which were then transformed into Christmas cards to raise money for the school funds during a mass production line over a couple of lunchtimes. 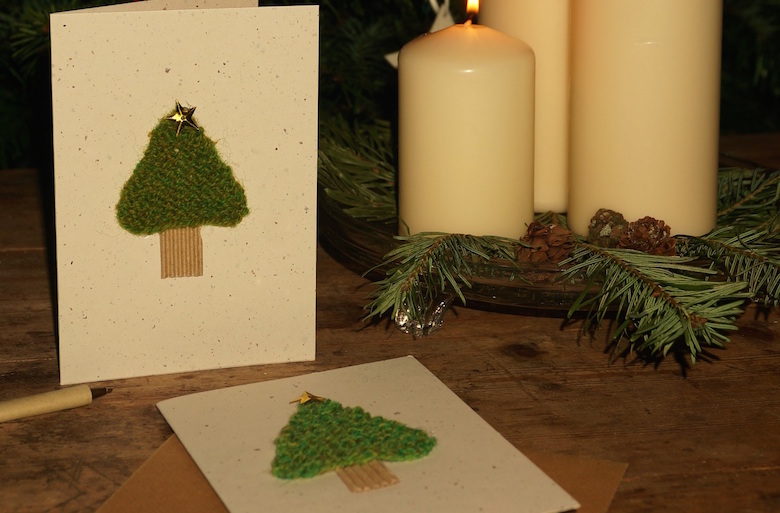 Last Saturday I spent a very enjoyable morning at AHS Christmas Coffee Morning helping out at the Maakin and Yaakin stand and needless to say, the cards featuring the hand knitted trees proved to be very popular. Pupils and staff also gathered in the ‘Knitters Neuk’ to spend time knitting and were joined by many members of the public who had come for their morning coffee and to browse the many stands in the school hall. The lunchtime Maakin and Yakkin sessions were started in February 2013 by biology teacher, Caroline Simpson, a keen knitter who thought that it would be a good way to bring pupils and teachers together with a common interest, while introducing knitting to those who were less experienced. I work as a science technician at the Anderson High School and go along to the group whenever I can. It is so good to see so many youngsters knitting and it is really good to see someone progress from never having knitted a stitch before to knitting Fair Isle. The group is part of the Peerie Makkers scheme, a two-year pilot scheme that encourages and enables skilled volunteers to teach traditional knitting methods to pupils in several schools around Shetland. When I was in Primary school, we all got knitting lessons, but several years ago these classes were stopped due to lack of funding. I remember at the time being horrified that this had happened and even wrote a letter to one of the local councillors, something that is not usually in my nature! However, through the Peerie Makkers scheme, and the enthusiasm of several volunteers things are definitely looking up and we are seeing pupils attending these knitting sessions because they want to rather than because they have to which can only be a positive thing. We are even hearing stories of the pupils getting their mothers interested in knitting which is fantastic! The Anderson High School Maakin and Yakkin group have been involved in several things and projects and have attended other knitting events and groups. In 2013 they made hats and tunics for babies in Malawi in conjunction with UNICEF, they have attended several events at Shetland Wool Week and this year several of the group members modelled their own work at the fashion show during the opening ceremony at the Clickimin Centre. I am very sure these are the people to look out for during future Wool Weeks! You can read more about the Maakin and Yakkin group on their new blog. We’ve just attended our first ever Shetland Arts & Crafts Fair which took place over the weekend in Lerwick. It was so good to chat to novice and experienced knitters, or those purely interested in Shetland’s wool and textile heritage. Shetland Wool Week really does have a diverse following! And, we’ll be hitting the road again in the New Year, so here are some dates for your diaries. 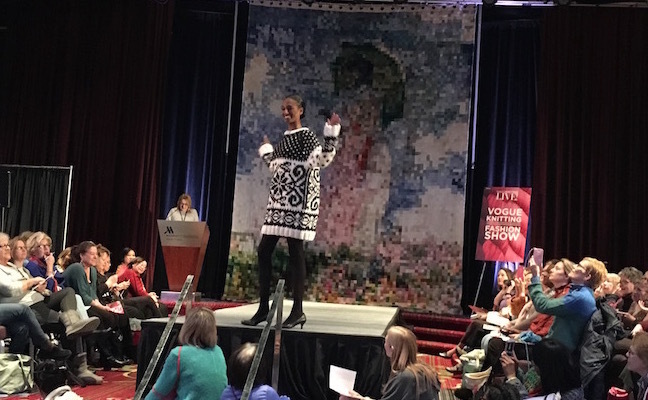 Having attended this very busy show last year, where we had such an incredible response and made so many contacts, we knew that we needed to exhibit again at VOGUEknitting Live textile and craft show New York, 13 – 15 January. We’ll be taking a stand and will be on hand to answer any questions, give details on SWW 2017 and chat about all things Shetland wool and knitting. 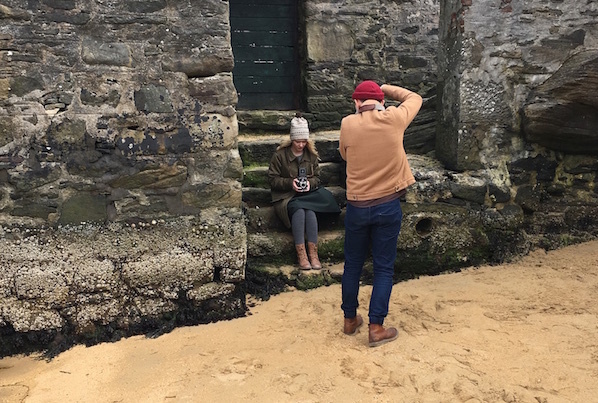 Take the opportunity to meet our SWW 2016 patron and knitwear designer, Ella Gordon and find out the inspiration behind the popular Crofthoose hat pattern. Also attending will be Dr Carol Christiansen, who is in charge of Shetland Museum’s Textiles Collection, a recognised Collection of National Significance in Scotland. Carol has extensive knowledge of historical and archaeological textiles in Shetland and the Nordic countries. If you’re planning a trip to the show, please come and visit us. We’d love to see you there. A must-have date for the diary is the popular international Yarn Festival in Edinburgh from 10 – 11 March. As well as taking a stand, we’ll be launching the official Shetland Wool Week 2017 hat pattern and also announcing this year’s patron. Printed copies of the pattern will be available too! 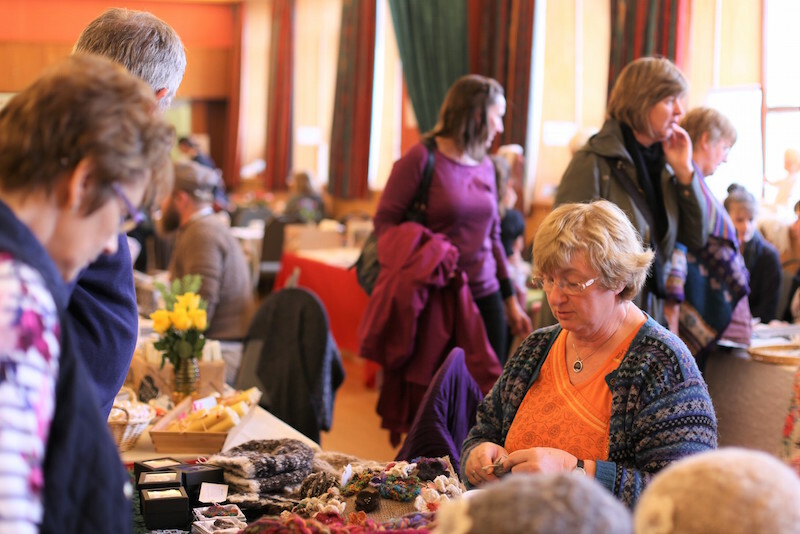 The seventh annual Shetland Wool Week was the biggest and busiest one yet! 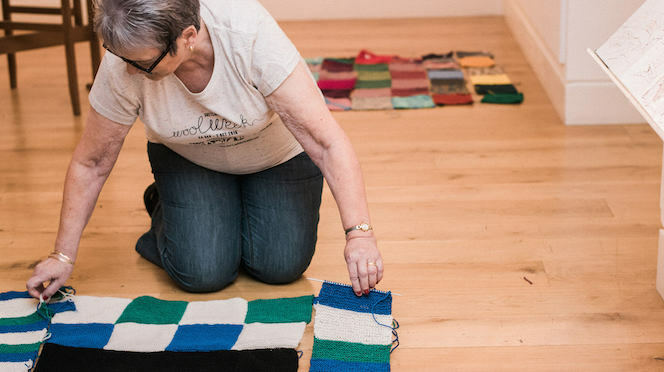 From the most northerly to the most southerly islands of the Shetland archipelago, participants indulged in wool-related workshops, drop-in sessions, talks, demonstrations, studio visits and our famous Sunday teas. Over 160 different events were offered, many with repeat sessions. 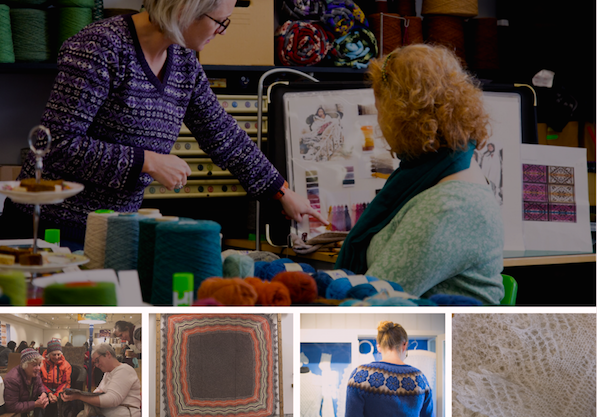 Many of Shetland’s most experienced makers, designers, and textile specialists participate each year by presenting courses and other events. For 2016 the programme had grown considerably large and varied covering everything from spinning, dyeing, many types of knitting, and weaving to making accessories for wool-working such as shawl pins, silver buttons and baskets. 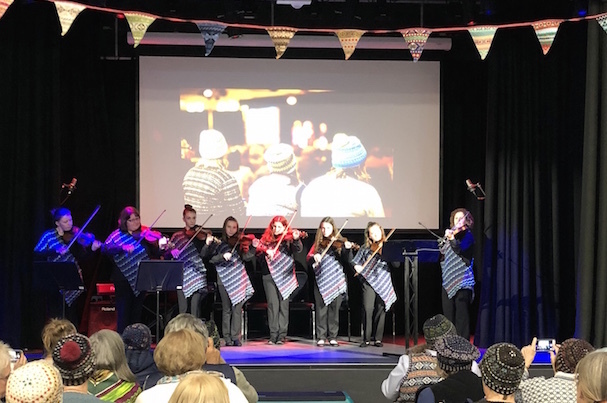 The Opening Ceremony was a wonderful way to kick off the nine-day festival and guests were given a snapshot of Shetland culture throughout the evening. 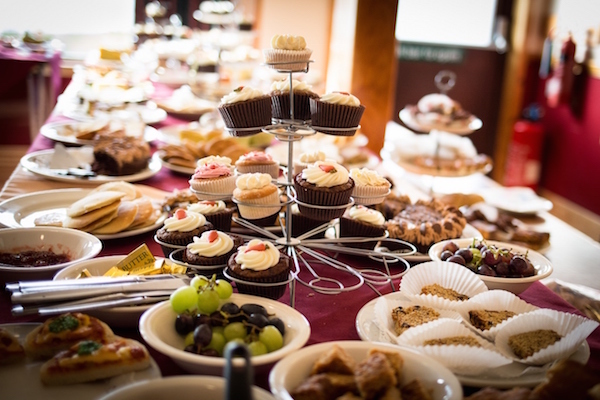 The Lerwick Jarl Squad put in a surprise appearance, and there were delicious canapes to try, using only Shetland produce and ingredients, as well as some painstakingly made, and very woolly inspired, cupcakes. There was music and talks and, for the first time, a Fashion Show, curated by Faye Hackers of Shetland College UHI. 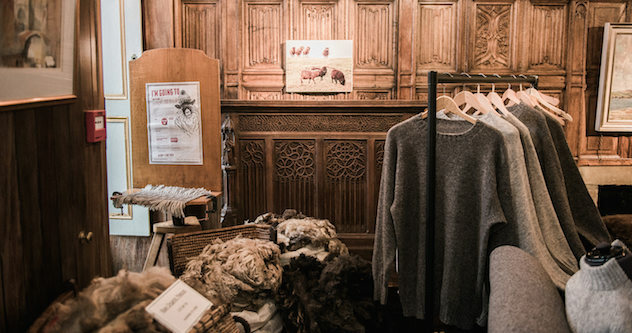 It was an eclectic display and showcased a variety of wonderful pieces from delicate handspun lace to Fair Isle jumpers and a dramatic Shetland tweed cloak. Keen that no one should miss out, the event was streamed live via facebook which meant that people all over the world could experience the evening. Fair Isle trip – a first for 2016, a lucky group of six ventured to this gem of an island to meet with Mati Ventrillon. 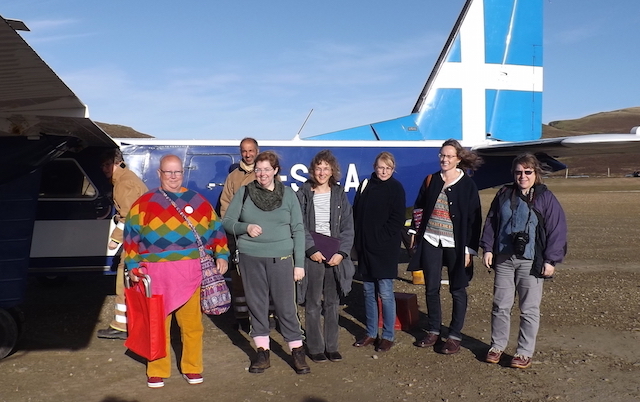 Blessed with beautiful blue skies, the six took the short plane journey and began their full day tour, which focused on island life and knitting. There was a guided tour to the South Lighthouse, and the Fair Isle Museum, as well as open studios and talks with Mati Ventrillon and Hollie Shaw. A delicious home cooked lunch at the Aauld Haa Gueshouse, followed by a trip to the impressive Fair Isle Observatory and Lodge rounded off a perfect day, and will remain a favourite for many. Joanna Hunter’s Havera island trip went ahead in a slightly different format due to bad weather, but everyone still had the chance to view knitwear made by its inhabitants back at Joanna’s home. Experienced wire lace knitter Helen Robertson, held ‘Light up your lace’ lampshade classes, which proved to be very successful, with many commenting on her wonderful teaching skills and calm approach. Participants left the class with a totally completed project. Natural dyeing workshops were available this year too, with Julia Billings exploring the essential steps involved in transferring the colour found in plants onto fibres. Shetland’s textiles and textile-making traditions are the focus each year but we also aim to bring different traditions into the mix by inviting foreign specialists. This year Estonian knitwear designer and researcher Kristi Jõeste joined us. She taught several classes in her speciality, Estonian glove-making, and one of her patterns was included in the Shetland Wool Week Annual. Along with Shetland knitwear designer and Finnish native Outi Kater, Kristi discussed her research and designs at our Baltic Night evening lecture. The popular Makers’ Market is an opportunity for local wool producers and makers to show and sell their wares during this nine-day event. It went down a storm with people keen to snap up a unique wool item. This year exhibitors featured yarn made from wool of Shetland’s two most remote islands communities, Foula and Fair Isle. Students from Shetland College’s Textile Department sold knitwear they designed and made in their courses and Shetland Handspun designer and maker Elizabeth Johnston made available her gorgeous hand-spun yarns in Shetland wool, coloured with natural dyes. Talks were a great way for people to meet up in the evening and mainly took place at the Shetland Museum and Archives. 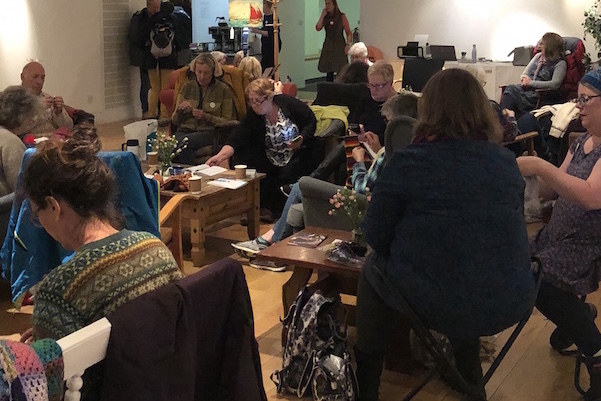 Again, they were mostly all at full capacity, with Baltic Knitting Night; and SWW Patron Ella Gordon’s ‘Being a Knitter in Shetland’ especially drawing in the crowds. This year the Shetland Wool Week Committee introduced a new online booking system using Little Box Office. This made registering for events easier, as tickets could be printed by the participant or simply shown on their phone, and allowed vendors to check participant numbers as events filled. This year’s HUB also enjoyed a change, and had moved from Islesburgh to the first-class location of the Shetland Museum and Archives. Here woolly participants could meet up with friends old and new, and enjoy a cuppa with their maakin. There were also many knitted donations throughout the week to the popular Shetland With Love charity. Shetland was blessed with ‘Indian Summer’ weather on most days but participants also got a taste of our wild and windy autumn weather. Even Da Mirrie Dancers, the aurora borealis, made appearances on several clear nights – truly a magical nine days. A big Shetland Wool Week thank you! Well, we’ve had a chance to recover from what was our biggest Shetland Wool Week yet! 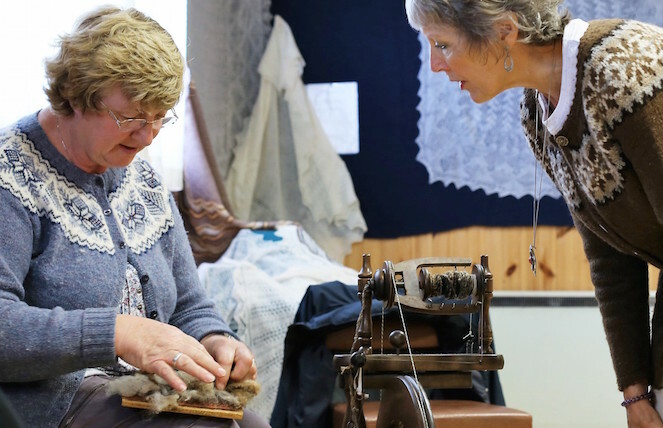 It was an amazing festival – packed with hundreds of classes, talks and tours, all celebrating Shetland’s fantastic textile heritage and crofting community. Now in its seventh year, our participant numbers have doubled – with almost 600 attending. As always, we are humbled by how far people will travel to join us. This year we welcomed visitors from all corners of the world from Norwich to New Zealand to Denmark and California. We’ll be circulating a round up shortly with highlights and photos of the event. In the meantime, we would appreciate it if you could take a few minutes to complete our short survey to help us with our planning for 2017. As ever, we are keen to make improvements and ensure that the event stays fresh and relevant, so your feedback is important to us. As a thank you, you’ll be entered into a free prize draw where you will have the chance to win an annual subscription to our 60North publication. The prize draw will close on 7th November 2016. Looking ahead to next year we are pleased to announce that Shetland Wool Week 2017 will take place from the 23rd September until 1st October 2017. Planning is now underway and we can promise you that 2017 is set to be another unforgettable year! We hope you enjoyed SWW 2016 and thank you for your continued support. 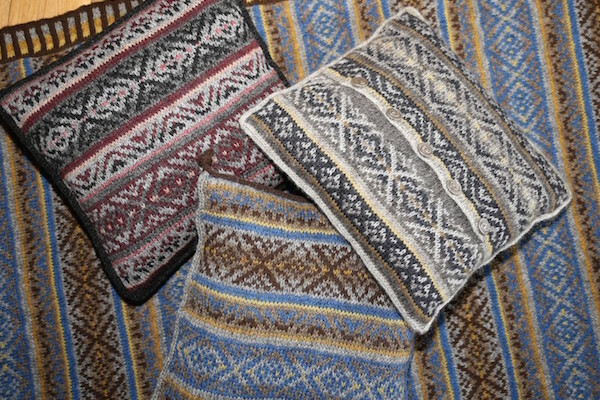 ‘FROM SHETLAND WITH LOVE’ CHARITY: BRING ALONG A KNITTED BLANKET SQUARE TO SHETLAND WOOL WEEK. This year we would like to give something back and support a charity close to our hearts, ‘From Shetland with Love’. 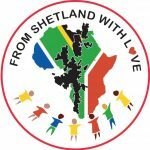 Founded by Shetlanders Mona and Iain McAlpine in 2005, the charity helps and supports children in Southern Africa who have been left orphaned due to HIV/AIDS crisis. We would like to pool your knitting talents and invite everyone to bring with them a knitted square, that we will link together to create beautiful, bespoke blankets which will then be sent to an orphanage in Lesotho. Mona and Iain lived and worked in South Africa for 32 years. As Mona is a midwife she had up close and personal contact with affected families, especially mothers along with their unborn babies, who back in the 80s and 90s had little or no hope of survival. They saw that the impact on families is devastating as adults become too sick to work and children already suffering from physical disabilities along with HIV are left abandoned and orphaned. On their return to Shetland Mona and Iain decided to set up the charity FSWL. To date, well over £100,000 has been raised. All funds go directly with the couple to Africa when they visit family there. Over the years, many orphans and orphanages have benefited including Gods Golden Acre (GGA); Good Will and Growth for Africa (GAGA); Rifilwe, Baby House and many more. The McAlpines source the recipients of the funds carefully and always support the most needful. 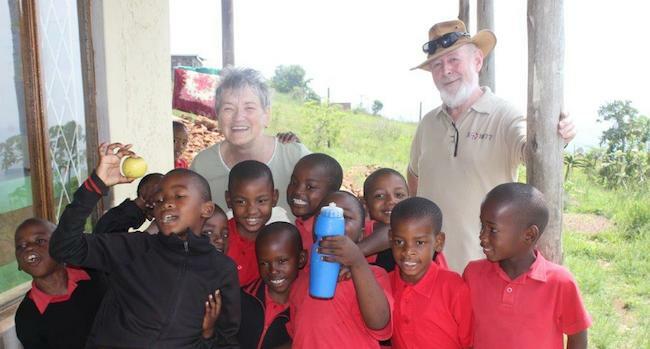 The latest project is ‘Morapeli’, an orphanage for Disabled Children in The Mountain Kingdom of Lesotho. Lesotho is warm and wet in summer and cold in the winter so blankets are always welcome. We think the finished blankets will look amazing – and, most importantly, they will also be of real, practical use in the orphanages. Any yarn, any design and any colour. There are a limited number of classes still available to book via the Little Box Office. Make sure you don’t miss out! This year’s HUB will be located at the Shetland Museum & Archives and it will be open from 24 September to 2 October. Opening times are Monday to Saturday 10am – 9pm, (bar service from 6-9pm) and Sunday 10am – 5pm. Please can we remind everyone to bring their own knitting needles. These will not be provided for every class. Check on the programme and online for further information. 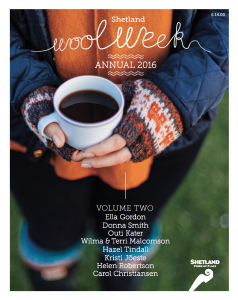 Last year’s Shetland Wool Week Annual was an instant sell-out, and this year’s edition, packed with exclusive patterns, fascinating essays, interviews with top knitters and glorious photography, is set to be a huge hit too. Among the full patterns provided, along with profiles of the designers, are Shetland Wool Week Patron Ella Gordon’s spectacular Crofthoose Hat and Crofthoose Mitts; Donna Smith’s beautiful Shetland lace Sanik Shawl; Outi Kater’s Fair Isle Snaefrid Legwarmers; Wilma and Terri Malcolmson’s Da Hölmin hat and a classic Brogash cardigan from Hazel Tindall. Also provided are patterns for Kristi Jöeste’s Muhu Fly Gloves, Carol Christiansen’s Küttikins slipper socks, Marian B Leslie’s Sleeveless Spencer and a design for Helen Robertson’s Light Up Your Lace Jar Lantern. Essays include Donna Smith on the phenomenon of the makkin belt, Tom Kidd’s fabulous photographs of 1970s Fair Isle gansies, Roslyn Chapman on the infamous Truck and Barter system of paying knitters, and the amazing story of how Shetland knitwear conquered Everest. Extraordinary illustrations, a selection of book reviews and some personal insights into the lives of the isles’ top knitters: The Shetland Wool Week Annual 2016 is available at £14, but get your copy quickly: it’s bound to be in short supply. 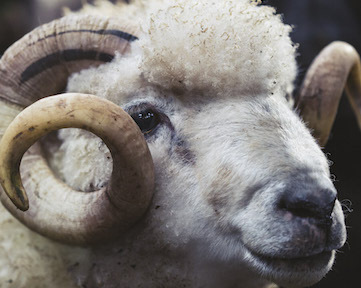 We’ve been overwhelmed by your response to the 2016 Shetland Wool Week programme. Already, many of the 300 classes have sold out – and while this support is fantastic news for the event, we’re keen to satisfy demand! We’ve teamed up with our brilliant tutors and have added more classes to the programme. As ever, classes are aimed at all abilities and interests, so take a look and come along and brush up on old skills or have a go at something new. Classes will go on sale on Monday 18th July at 1pm BST on The Little Box Office. 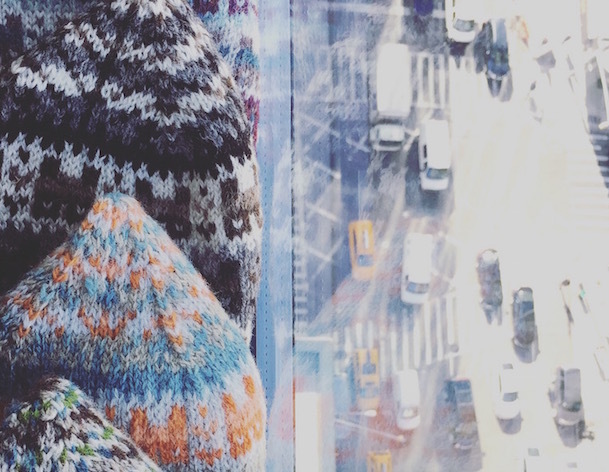 Fair Isle yokes are enjoying a surge in popularity. Tutors, Jeannie Tulloch and Janette Budge will show you how to blend colours and shape yokes in traditional fair isle knitting. Your morning coffee will never look the same again, once you’ve learnt how to knit a Fair Isle or sheep mug cosy! The talented Donna Smith has devised this ingenious workshop. We can’t wait to see the results and think it may just send instagram into overdrive! A first for Shetland Wool Week is the introduction of some yoga classes. You don’t need to be an expert, the classes are aimed at all ages and abilities and are there to help you keep your fingers flexible and posture upright. Classes are in the morning and last for 45 minutes – the perfect way to start a day of knitting. There are now spaces available on this popular class, which introduces beginner knitters to the Shetland lace tradition. You’ll gain a detailed understanding of the patterns and colours that go into this beautiful technique, giving you the skills to be able to knit your own scarf at home. Extra spaces are available on this full-day tour of Whalsay, long known in Shetland as ‘Da Bonnie Isle’. You’ll pack lots in, with a visit to the Whalsay Heritage and Community Centre as well as the renowned charity shop ‘Shoard’, where you’ll get a chance to browse and purchase local knitwear. The day will culminate with a visit to the local hall’s ‘tak your sock’ night where you’ll get the chance to chat with Whalsay knitters. Ex SWW patron, Donna Smith’s popular class has been extended for one more session. Here, under Donna’s expert tutelage, intermediate knitters can learn about the traditional method of lace construction where the hap (or wrap) is knitted from the outside towards the centre. 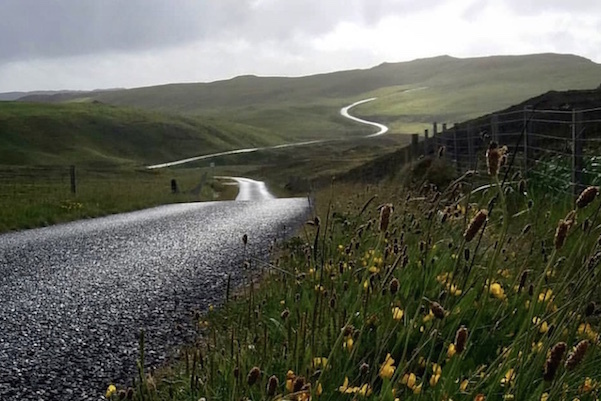 Shetland’s ever changing landscape is a constant source of inspiration. Let your imagination be guided by Donna Smith, who will help you create a colour palette from a photograph, which will be transformed into your own Fair Isle swatch. Put paid to the mystery of Fair Isle knitting and join Fair Isle resident and curator, Anne Sinclair at the Shetland Textile Museum. Here she will answer your questions and uncover over 150 years of colourful history. Try your hand at these unique traditional Shetland bedcoverings and create your own rug out of Fair Isle Home-Grown wool and Uradale Shetland Organics Yarn. You’ll be involved with the whole process from sorting wool through to construction and finishing. This beginner’s course is the perfect introduction to spinning – and you’ll get to create something useful in the process! Expert spinner Kathy Coull will show you how to make your own reed basket – which will be the perfect accompaniment to any spinners’ wheel. 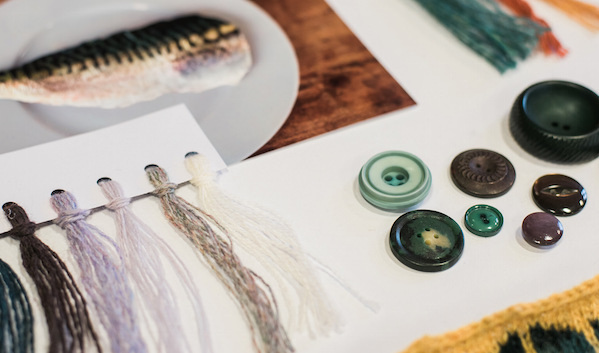 Unearth designs you never knew were inside you and join local designer Joanna Hunter at her studio Ninian, for a workshop in developing mood boards and playing with colour. Be inspired by the array of yarns and dig into Joanna’s samples to make new and exciting colour palettes. There are now more spaces available on this popular class. Learn the traditional and unique way of knitting from Sweden. You’ll learn the technique of using two threads and twisting them alternately to make beautiful and strong knitting. Remember there are still a few spaces available on classes listed in the programme, so take a look and book your spot. This is the 7th year of Shetland Wool Week and we have been busy the whole year preparing an exciting programme of events for you. There will be an extensive range of exhibitions, classes, workshops, tours and lectures, covering many different subjects including weaving, spinning, dyeing, Fair Isle and lace knitting as well as lots of other fascinating subjects. 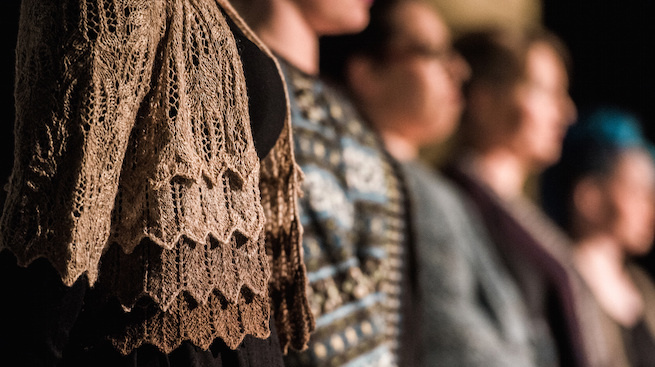 Events will take place from Fair Isle right up to Shetland’s most northerly island of Unst, famous for its beautiful lacework, with many locations in between. The bookings open today (Tuesday 24th May) at 1pm BST. This year we are using The Little Box Office and those of you who have purchased a SWW Membership already know the system. To book tickets for classes you do not have to create an account, all you need to do is add tickets to your shopping basket and then check out. It will also be possible to book by phone but please note that we are a small team so we advise you to book online to avoid any delays. In case you are unable to book online the phone number is +44 (0)1595 980100. On Tuesday afternoon it will also be possible to book in person at Shetland Museum and Archives. We hope you find this year’s selection of events inspiring and we look forward to seeing you in Shetland in September. P.S. This week Kate Davies is taking over our Instagram so make sure you follow us! Shetland Wool Week 2016 pattern is here! 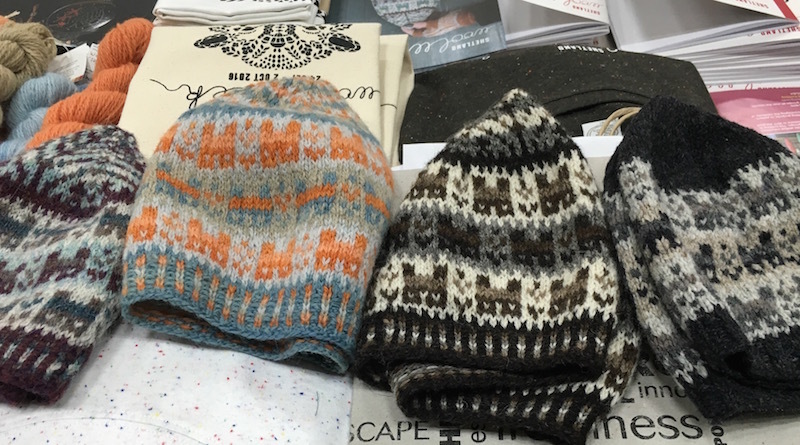 We have some very exciting news – the official Shetland Wool Week 2016 hat pattern is being launched today at Edinburgh Yarn Festival. 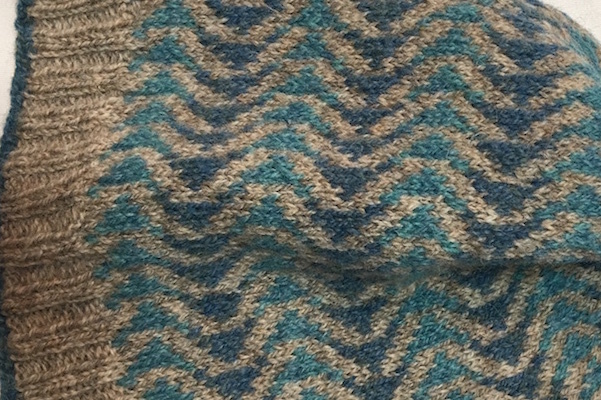 This year’s pattern is called ‘Crofthoose’ and it has been exclusively designed by Ella Gordon, the patron for 2016. Knit the hat in any of the suggested colours or your own variations and wear it to Shetland Wool Week 2016. You can spot your fellow Wool Weekers and compare hats at the opening ceremony. If you are at EYF make sure you pop along our stand H7 and pick up a printed copy of the pattern. You can also download a copy of the pattern online here. Please do share your pictures with us using #crofthoosehat, we can’t wait to see your creations. Textile designer Ella Gordon will be guest patron for this year’s seventh Shetland Wool Week. She was elected in a unanimous vote by the festival’s committee. 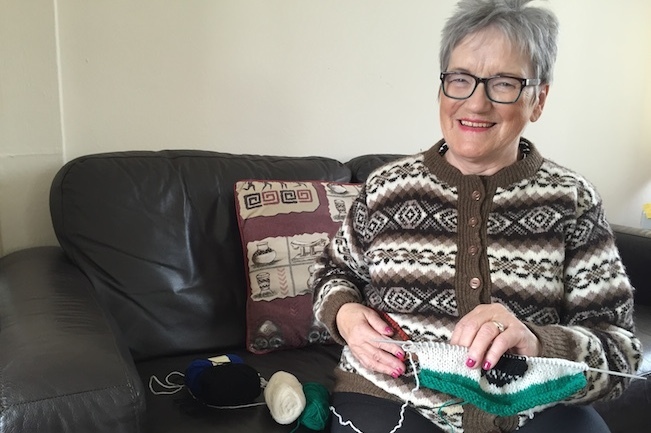 The event attracts hundreds of international visitors and knitting enthusiasts to the isles. Last year’s was hailed as the most successful yet, with over 300 people attending from throughout the world. The festival brought in at least £300,000 to the local economy, an increase of £101,000 on 2014’s £199,000. 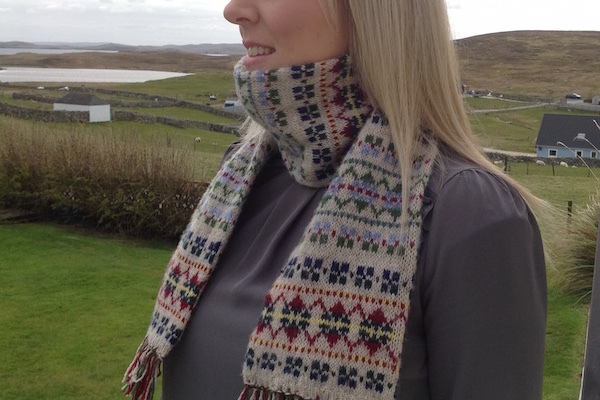 Ella was born and brought up in Shetland and studied textiles at Shetland College. Since 2011 she has worked at local wool brokers Jamieson and Smith and she also has her own small business making crofthouse-shaped cushions. She is very interested in traditional techniques, patterns and colours, but uses them in a contemporary way. Ella has a real passion for knitting and Shetland heritage, which makes her an ideal candidate for the role of patron for 2016. 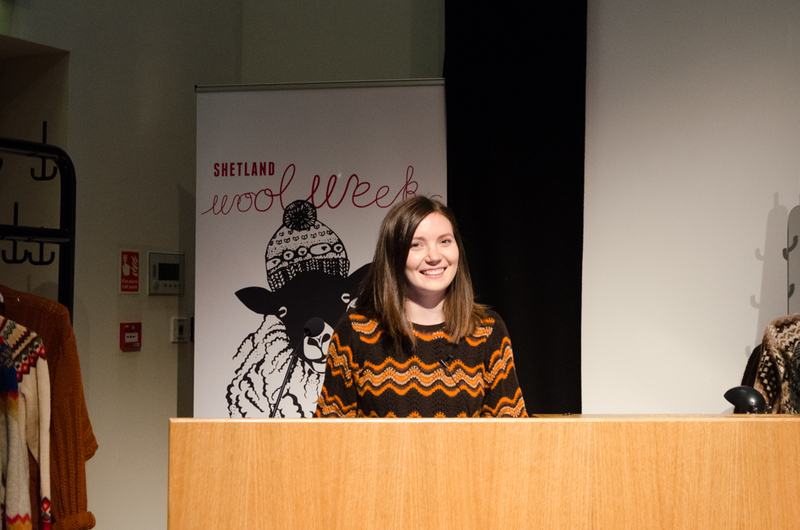 “I was very proud and excited to be asked to be Shetland Wool Week Patron for 2016,” she said. “I am extremely passionate about Shetland’s textile culture and heritage. I actually got my job at Jamieson and Smith by helping out at the second Shetland Wool Week, so I have seen the festival grow from strength to strength every year. I have met so many people from all over the world every year at Wool Week and I’m really looking forward to this year’s event, although it will be a very busy time for me! After graduating with a degree in Contemporary Textiles from the Shetland College in 2012, Ella was mainly a machine knitter but has become increasingly passionate about her hand-knitting skills. She has exciting plans for a knitting pattern specially designed for this year’s event. Full details will be revealed at next week’s Edinburgh Yarn Festival. A programme of events celebrating Shetland textiles will culminate with the official Shetland Wool Week on 24 September until 2 October 2016, with the full programme to be announced in April. Shetland Wool Week Programme Director Misa Hay, was delighted at Ella’s appointment. 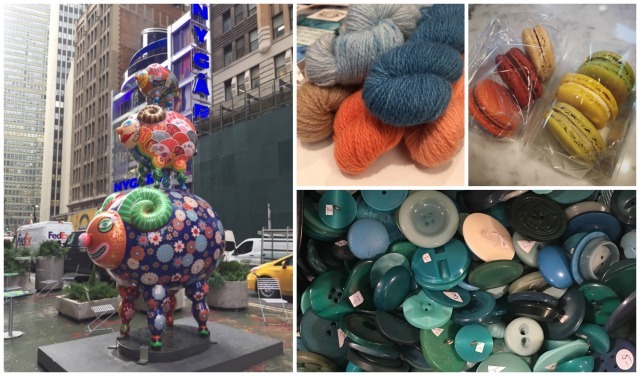 Donna Smith swapped the quiet island life for that of a rock star last month when she visited New York City for the Vogue Knitting Live textile and craft show. 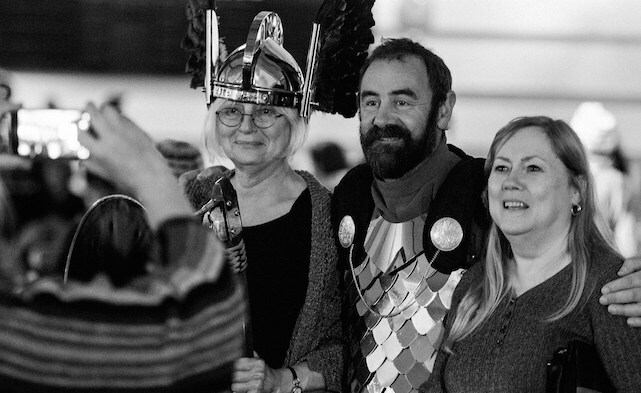 Part of a team promoting Shetland’s annual festival of knitting, Wool Week, of which she was the 2015 patron, Donna was mobbed by passionate fans desperate for hints and tips on how to produce Fair isle knitwear. “It was all quite surreal,” she said. Donna sat and knitted at the Shetland Wool Week stall, exciting watchers by her use of the traditional Shetland ‘makkin belt’, a leather ‘third hand’ worn around the waist and holding an extra needle And her design for a Fair isle bobble hat featuring sheep – the ‘Baa-ble’ hat – has become a transatlantic sensation. The ‘Baa-ble’ was Donna’s official design to celebrate the 2015 Shetland Wool Week and has clearly captured American imaginations. 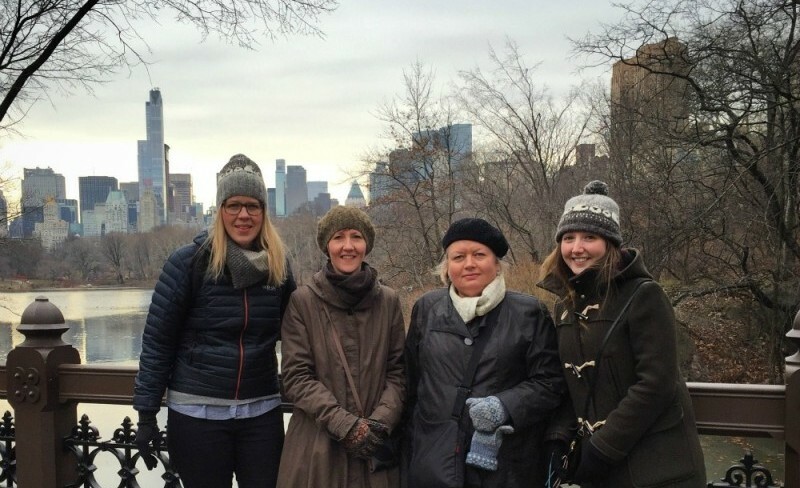 It was the most queued pattern on the craft textiles social network site Ravelry in 2015 and was one of the reasons the four-strong team from Promote Shetland decided to go to New York. Baa-ble hat pictures with the designer Donna Smith. “It was a risk,” admitted Misa Hay, Wool Week organiser, “but we discovered that more and more Americans have been coming to Shetland Wool Week, and we sold over half of the Shetland Wool Week Annual’s print run to the USA. We took 2000 copies of a leaflet about Wool Week which included the pattern for Donna’s now-legendary Baa-ble hat, and they were all handed out. We reckon to have spoken to about 2500 folk over the two and a half days of the event. 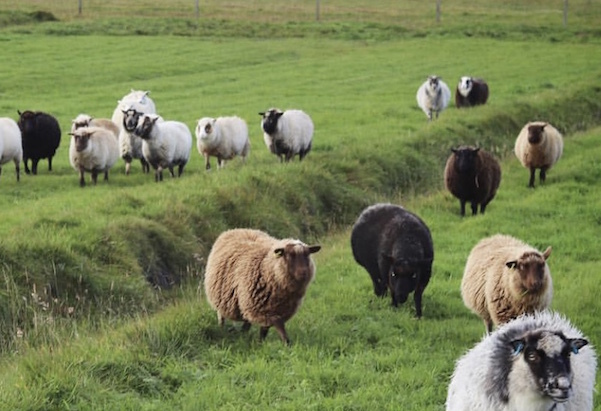 The spectacular and continuing success of Shetland Wool Week has illustrated the importance of the American market when it comes to knitting and island textiles generally. 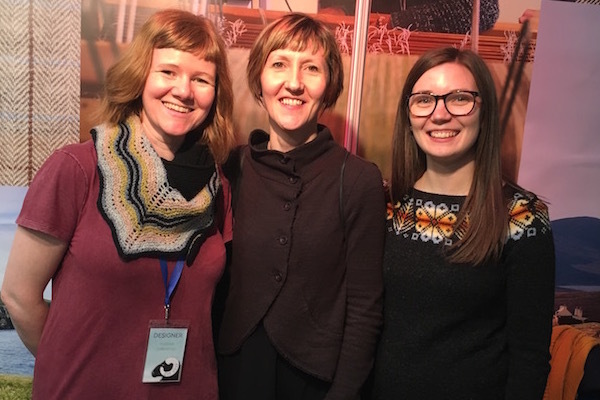 So it was strategically important for Shetland to be represented at what is perhaps the biggest and most prestigious knitting show in the world – January’s Vogue Knitting Live. 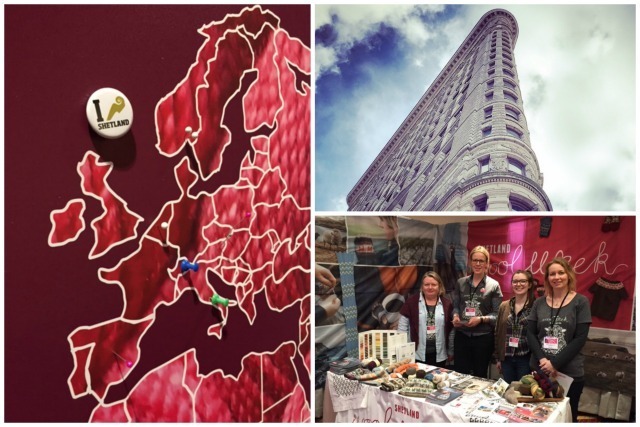 Four of those most intimately involved in Wool Week, – Donna Smith, the event’s patron in 2015, Carol Christiansen of Shetland Museum, with Kirsty Halcrow and Misa Hay from Promote Shetland – travelled to New York where they had a booth at the exhibition. Perhaps the weather in New York during the festival contributed to the popularity of Shetland knitwear and indeed the ‘Baa-ble’ hat: Temperatures were as low as minus 11 degrees Celsius and the following weekend saw the worst blizzard to hit the city in decades. Download the baa-ble hat pattern here. Check out our latest news on Ravelry. 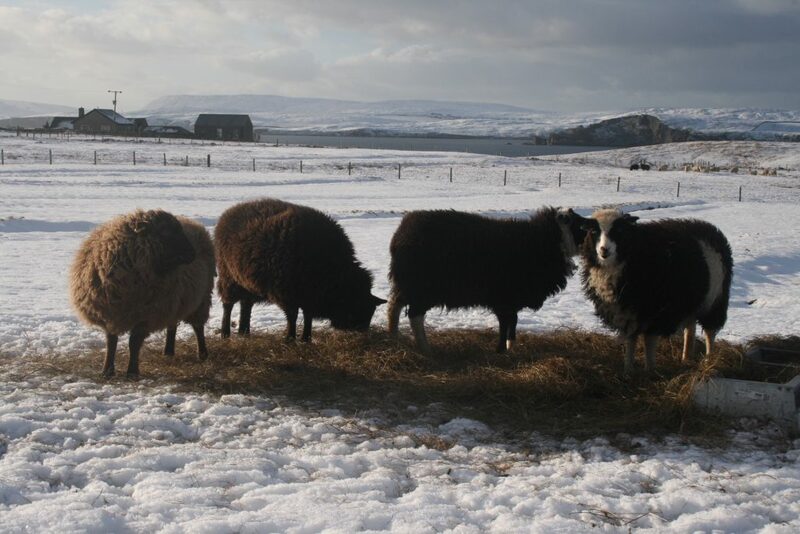 We are delighted to announce that we will be holding a Shetland Wool Holiday from 3rd-9th March (6 nights) 2016. We would love for you to join us on a journey through Shetland and discover our unique textile heritage. 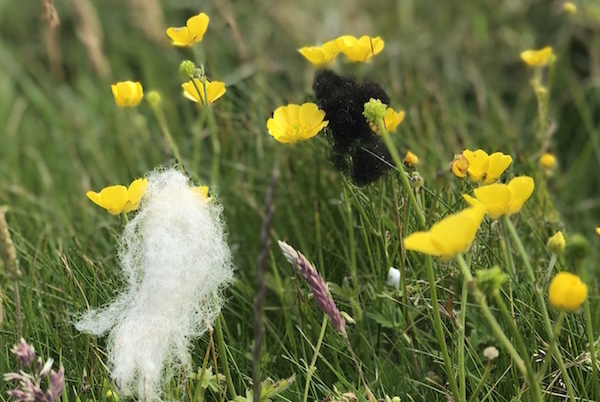 Our packaged holidays are designed to give an insight into Shetland’s textile traditions, industry and local crofting community as well as to explore our beautiful islands. These trips provide local knowledge and history as well as excellent learning opportunities in knitting and spinning from local expert tutors. Knitting, spinning & dyeing classes led by some of our top tutors, including classes in Fair Isle and Shetland lace. A visit to a local crofter and a tour of the Shetland Museum & Archives extensive textile collection. Please note the cost does NOT include travel to/from Shetland. We are also planning additional Wool Holidays in June, August & October and hope to release dates for those soon. 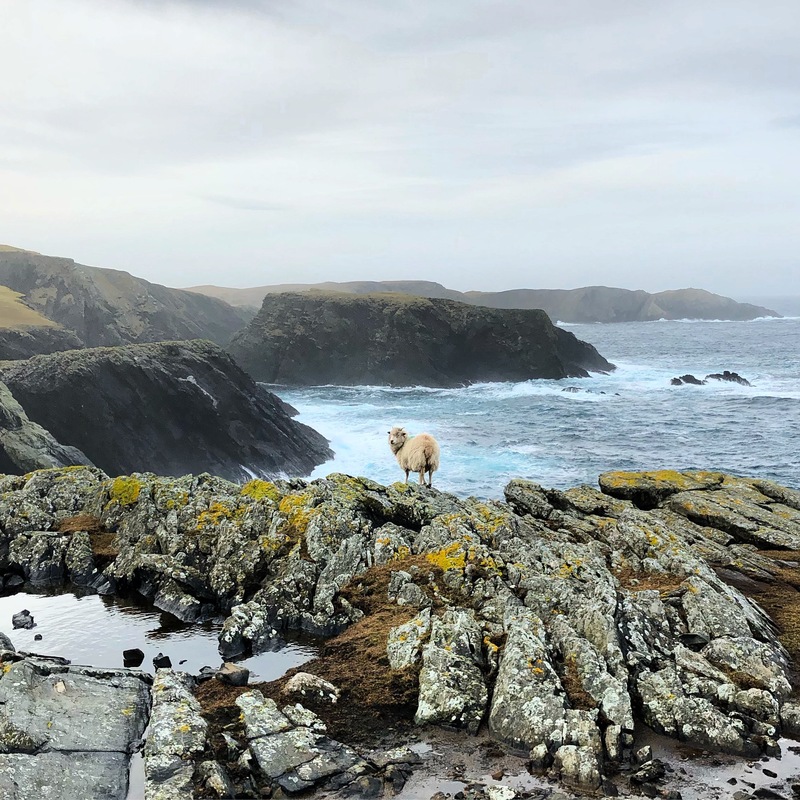 Wool Grading Tour at Jamieson & Smith Shetland Wool Brokers Ltd.
Drive to Sumburgh via scenic spots including the world famous St Ninian’s Isle which is a small island connected by the largest active sand tombolo in the UK. Please note that some elements may be subject to change. A detailed finalised itinerary will be provided to all participants in January. Spaces are very limited on this holiday so if you would like to make a reservation please contact Shona Fullerton on 01595 694688 or shona@shetlandamenity.org. We require 50% (£725) to confirm a booking and the remaining 50% will be due 28 days prior to arriving in Shetland. The price includes single occupancy of a room. For any holiday participants that wish to share a room, the total cost will be £1350 – a saving of £100 per person. Anyone wishing to share a room with a non-holiday participant will be required to pay an extra £200 for the 6-night duration. Please also note that the itinerary starts early on Thursday 3rd March so we advise you arrive in Shetland no later than 2nd but it is your responsibility to find accommodation for that night. During Shetland Wool Week 2014 we invited Stella Ruhe to teach classes based on her book, Dutch Traditional Ganseys. Stella has had a busy year since then: she has given talks about her research, published a second volume (in Dutch only so far) Vissers Truien 2 and exhibited the ganseys at museums in the Netherlands. I visited Stella in Amsterdam at the end of November and we travelled to the Rotterdam Maritime Museum to see the exhibition there. Ganseys related to the Rotterdam area were given pride of place and the museum displayed fascinating information about the lives of fishermen and fisher families. The ganseys were hung in two groups by colour, which allowed for close inspection of the different yarns used – from traditional smooth gansey wool to fuzzy Icelandic léttlopi. Each gansey was identified with a tag naming the port of origin. The ganseys have moved to Katwijks Museum and will be on show through April 2016. Fishermen from Katwijk visited Shetland each year and their ganseys, along with those from other Dutch ports, were common sights in Lerwick harbour. If you are considering knitting one of these beautiful jumpers, go and see the garments first to choose a favourite – it won’t be easy! 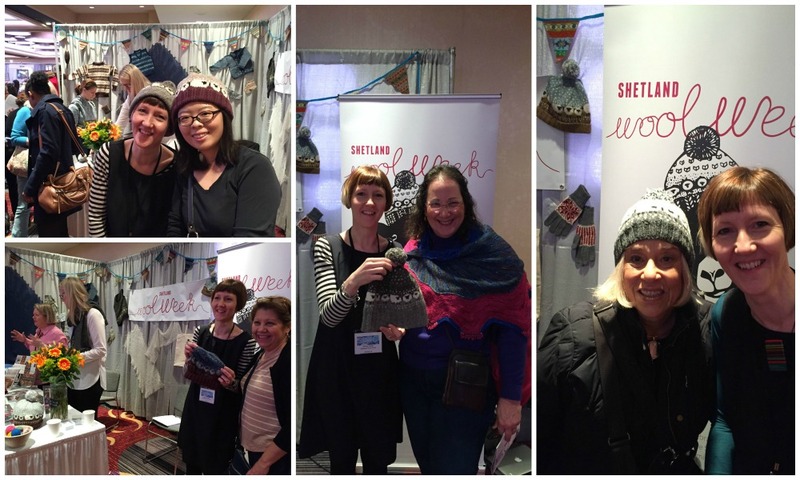 Firstly we would like to say a big thank you to all who took part in Shetland Wool Week 2015. It would not be the success it is today without the industry coming together and those who took part in the wide variety of events. 2015 was a huge success with over 320 participants enjoying the nine day event and over 1100 class spaces sold. We estimate that £316,000 was brought into the local economy, a 59% increase from 2014 and our newsletter subscribers have increased from 3000 to over 14000 in a year. I think it is safe to say that Shetland Wool Week is now an established and well respected event and we hope it can continue to grow and develop in the future. Part of our promotional plans in 2016 include attending a Vogue Knitting event in New York in January, where we will announce the SWW ’16 Patron and then the Edinburgh Yarn Festival in March. We are now in the planning stages for 2016 and hope to have as many involved as possible. As in previous years, Shetland Wool Week will offer a number of ‘core’ events, which will include talks, demonstrations and workshops. The involvement of local craft makers, designers, industry suppliers, tutors and retailers is key to growing the event, and we are now offering the opportunity to get involved in the 2016 programme. If you would like to be involved and feel you would be able to deliver an event, class, open studio, display or promotion please let us know by completing and returning the enclosed booking form. If you would like to discuss your ideas or have any questions, you can email: misa.hay@promoteshetland.com. In addition, we are planning to hold a fashion show as part of the 2016 event and would like to hear from anyone who would be interested in having their garments showcased. We are pleased to announce that Taatit Rugs: the pile bedcovers of Shetland, has now been published. The book culminates a two-year research project funded by the Esmée Fairbairn Collections Fund. It was written by Carol Christiansen, curator at Shetland Museum and Shetland Wool Week Committee member. The work looks extensively at the history of these heavy bedcovers, their relationship to rya rugs from Nordic countries, and their use in Shetland households from the 18th to the 20th centuries. 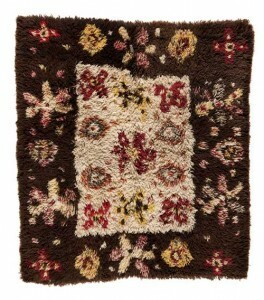 The book highlights more than 80 individual bedcovers, including colour images and historical research into each rug. 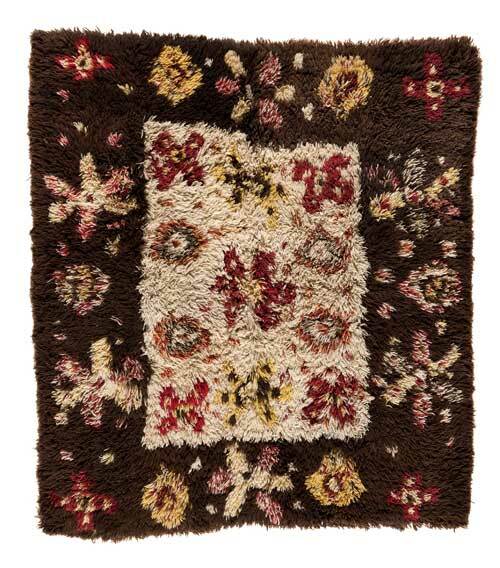 Details of rug sizes, spin direction and thread counts are provided for the craft specialist. Carol undertook research into the designs of the rugs, examining the use of dyes, including many lichen dyes. The project allowed for dye analysis to be done on a number of rugs and the results reveal that Shetland makers were knowledgeable and experimental in their use of natural dyes. The motifs used in the rugs are bold and graphic, and Carol has investigated the possible links with Shetland folklore beliefs. The work explores this little-known aspect of Shetland’s textile history and compliments the many publications available about Shetland knitting. It is available to order from the Shetland Heritage Shop: www.shetlandheritageshop.com.